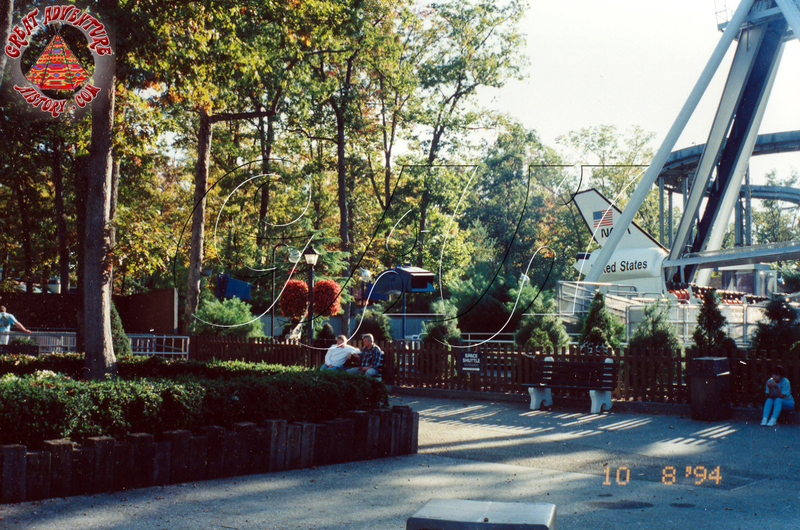 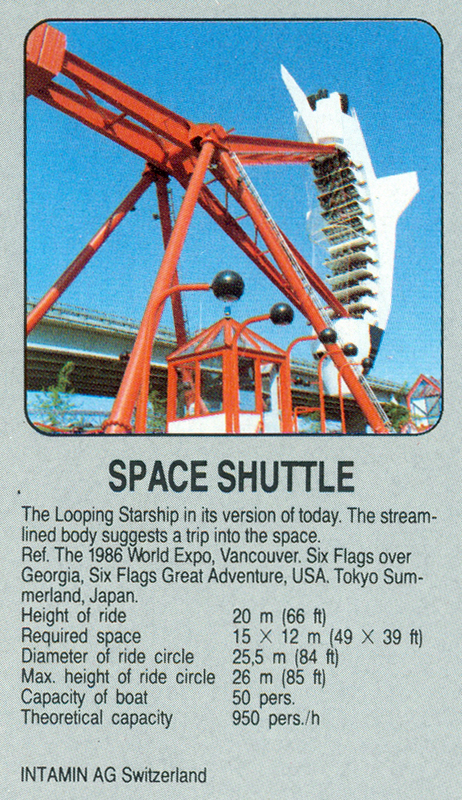 The Looping Starship was added to the Great Adventure for the 1985 season. 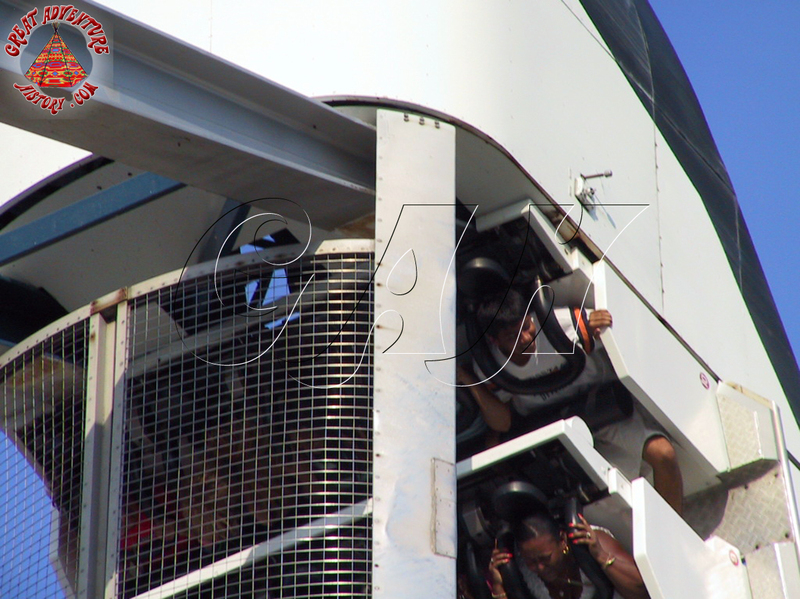 The ride was part of a growing trend in parks throughout the country to add the latest version of the popular swinging ship rides which now featured a full 360 degree loop. 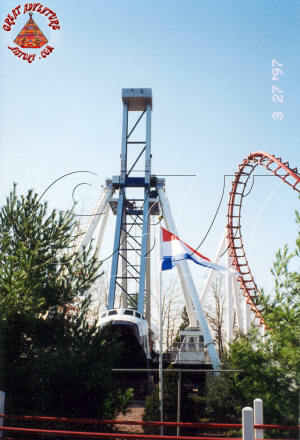 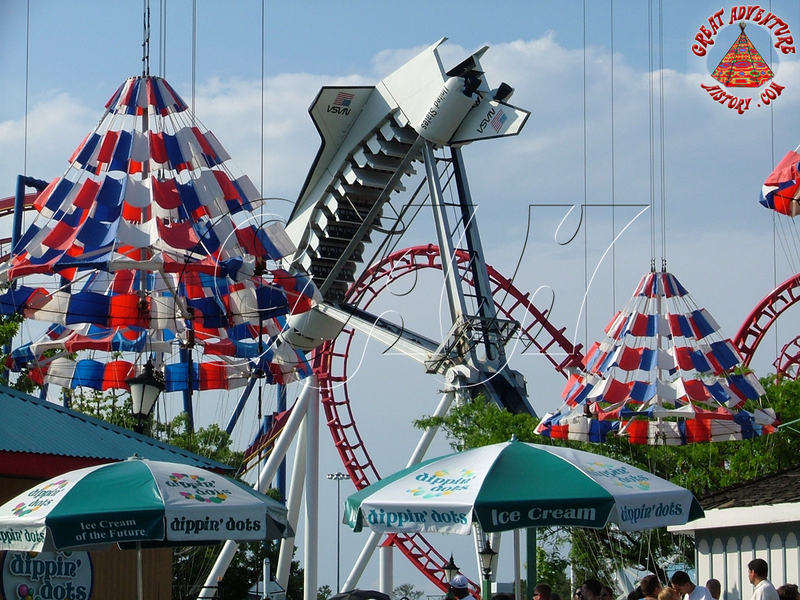 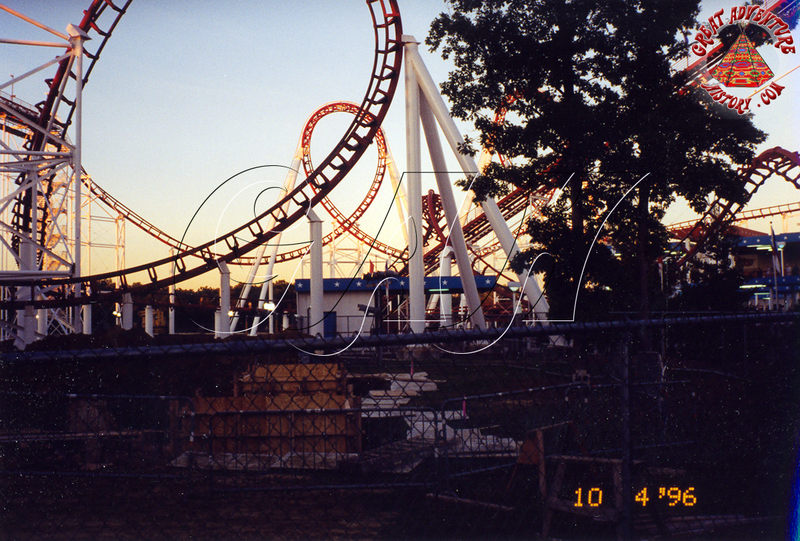 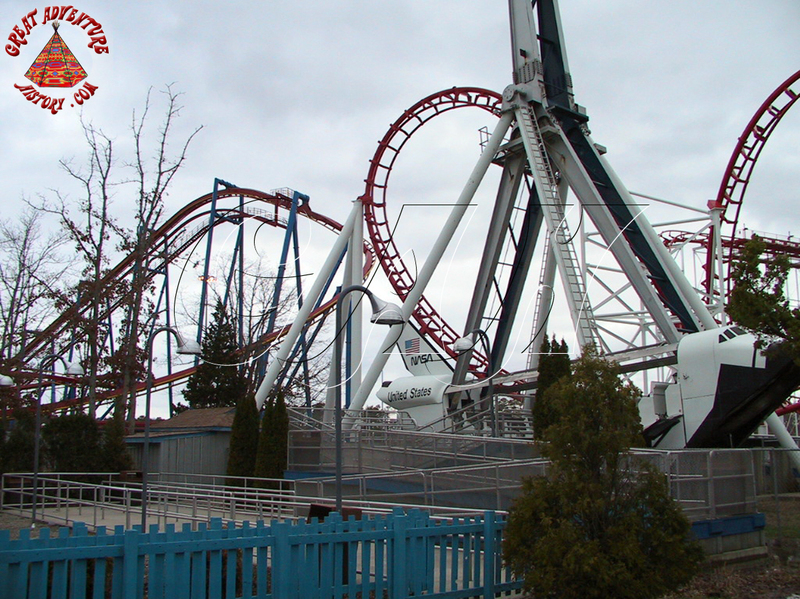 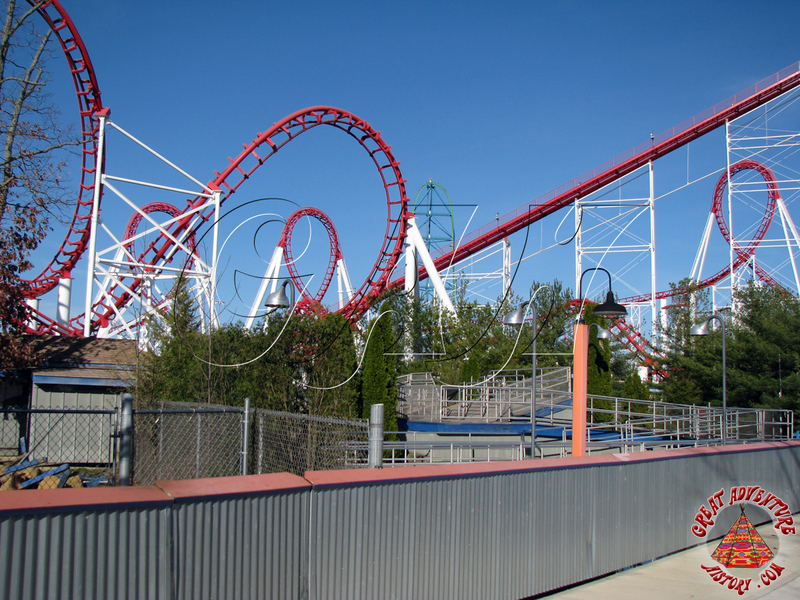 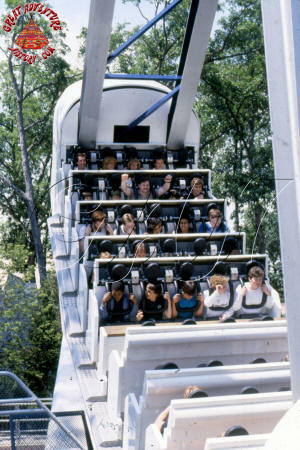 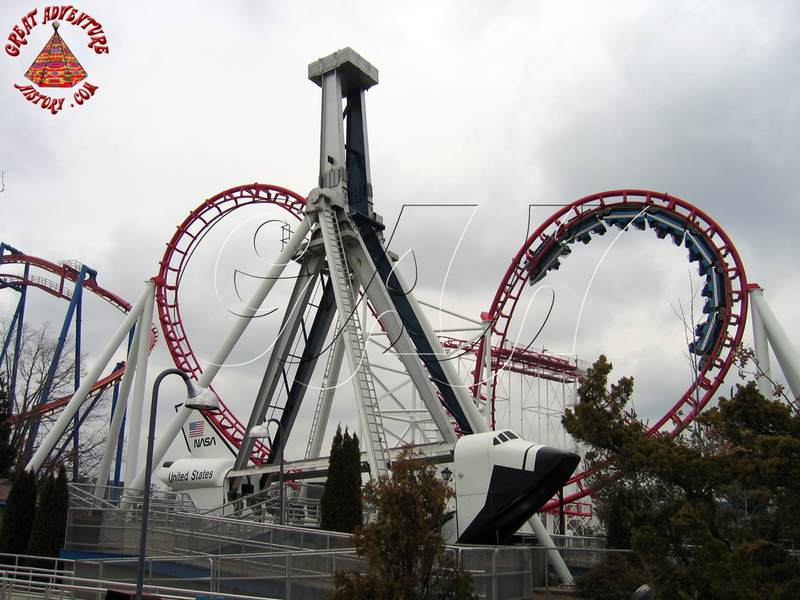 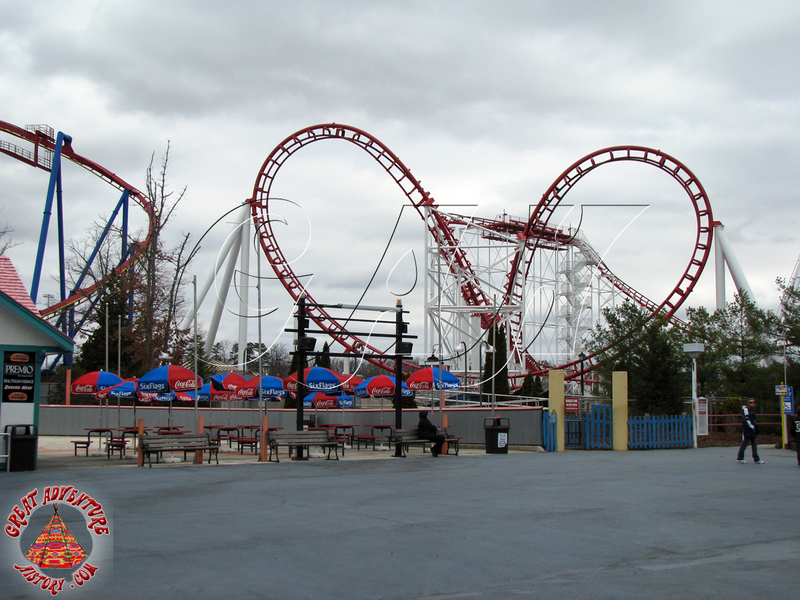 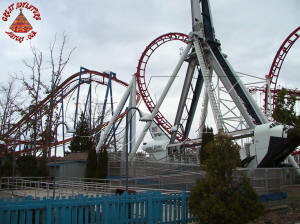 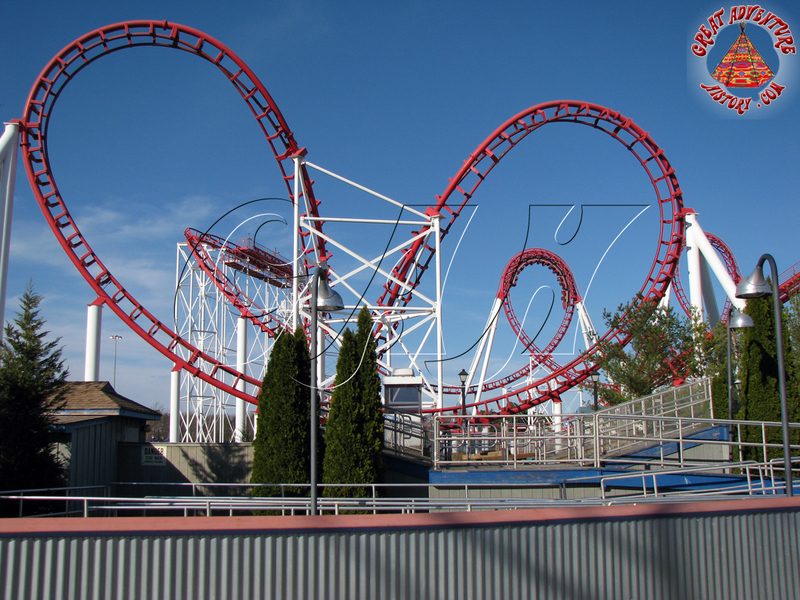 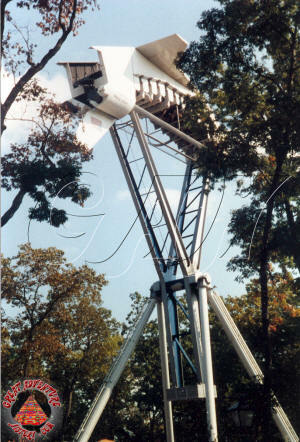 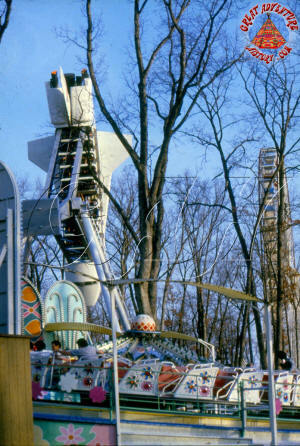 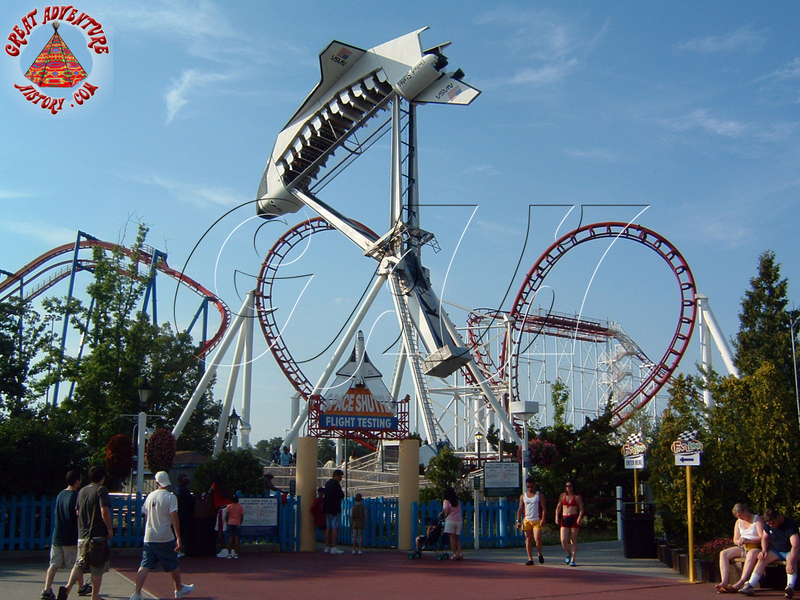 Six Flags and other park companies installed these INTAMIN built rides with various themes including clipper ships, planes, and space shuttles. 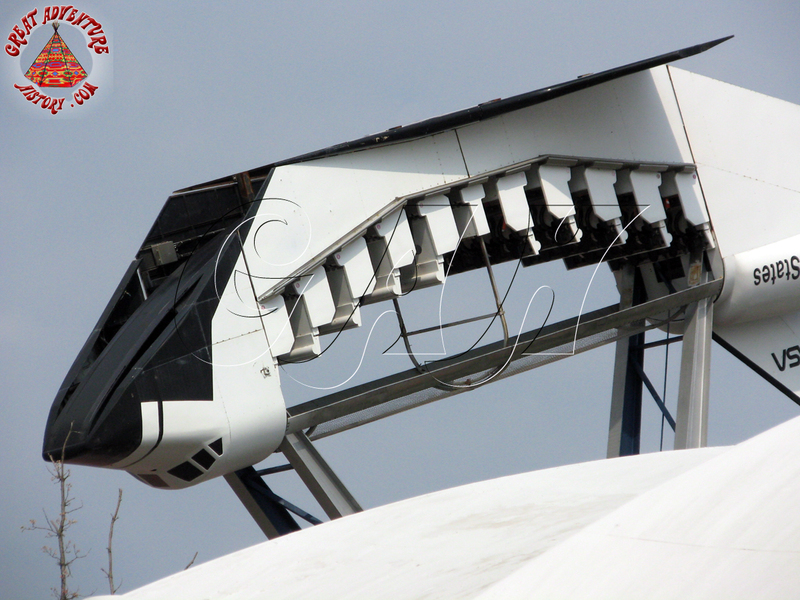 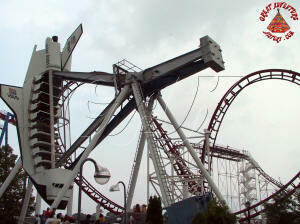 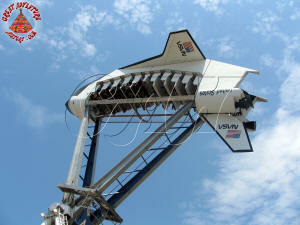 The Looping Starship, which was later renamed Space Shuttle, was dismantled during the 2007-2008 off-season. 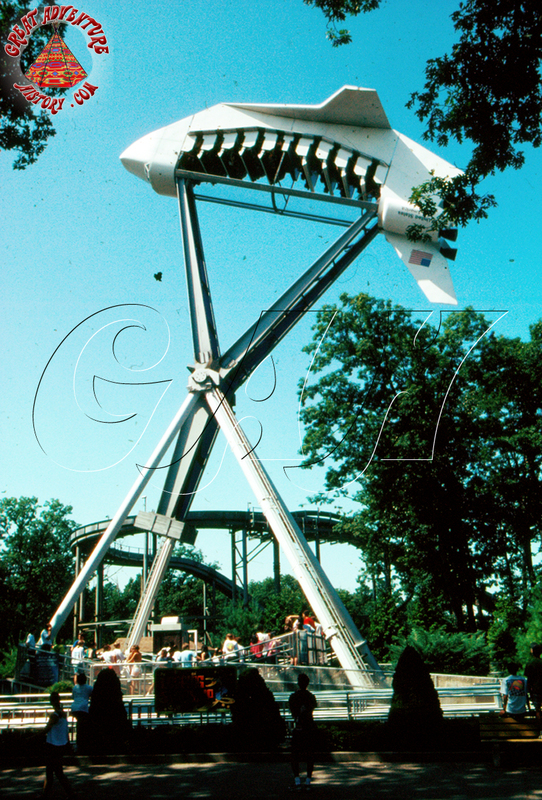 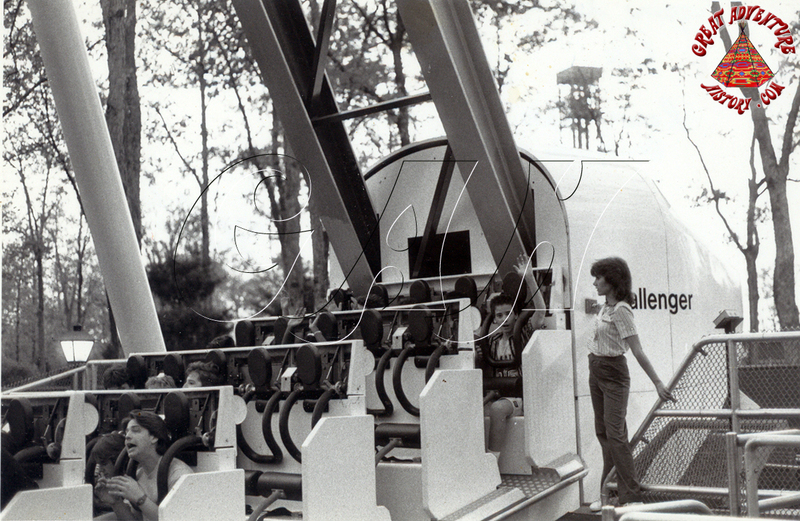 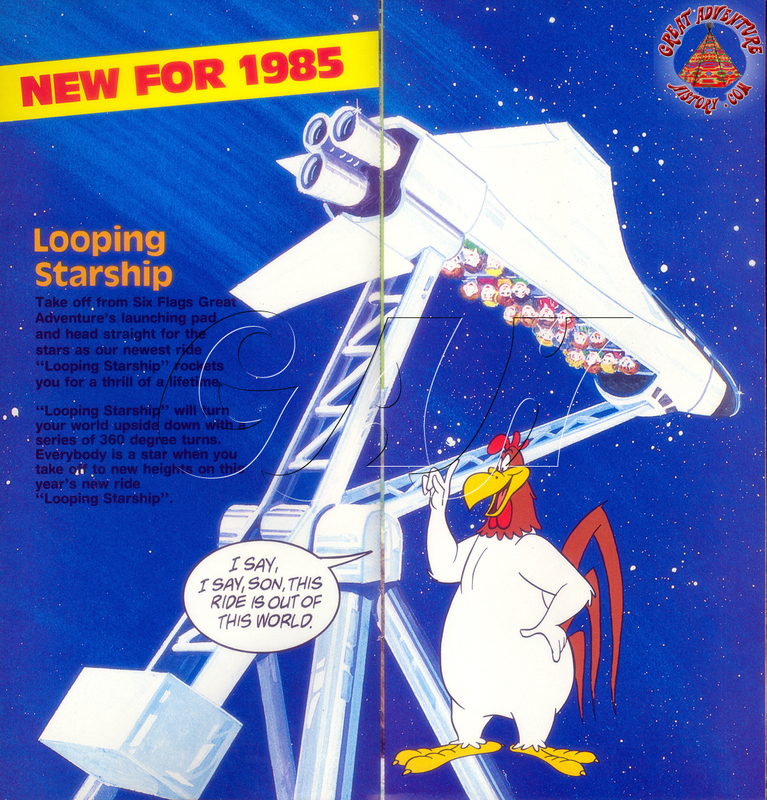 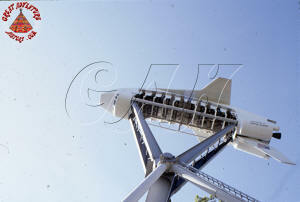 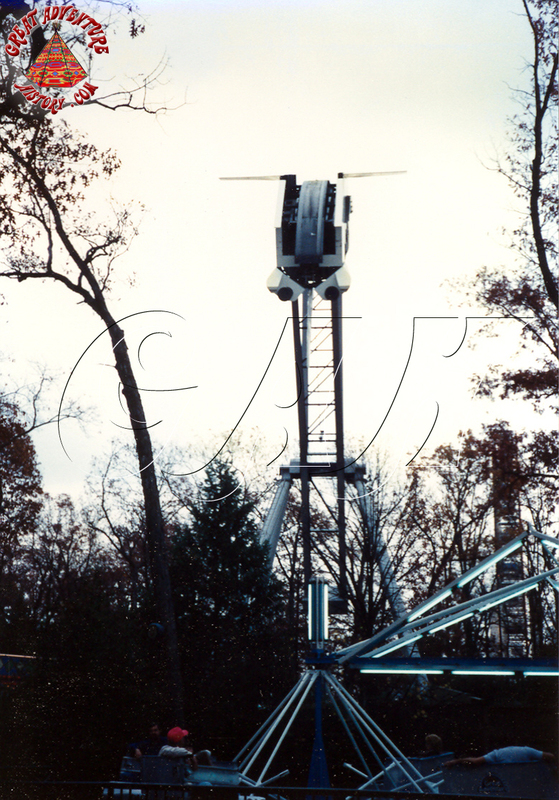 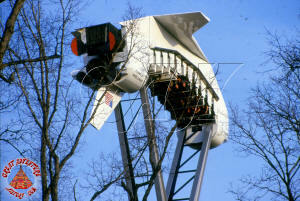 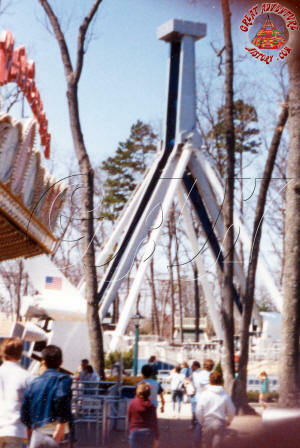 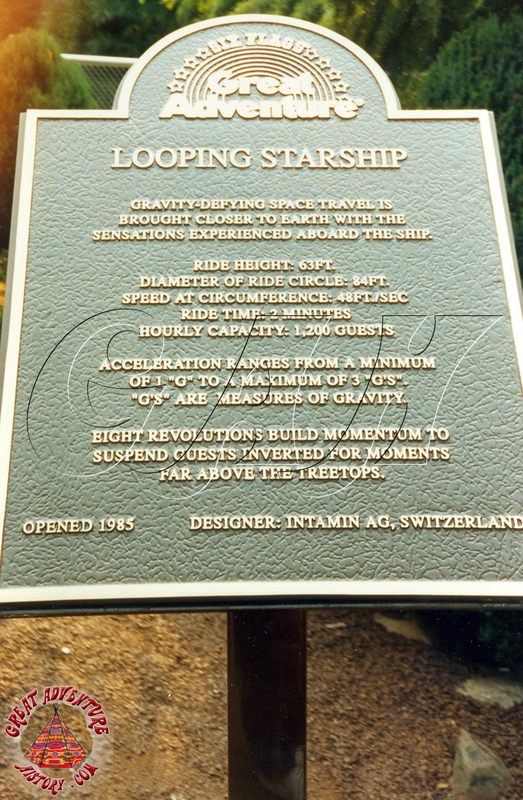 The Looping Starship was introduced as a thrilling new attraction for the 1985 season. 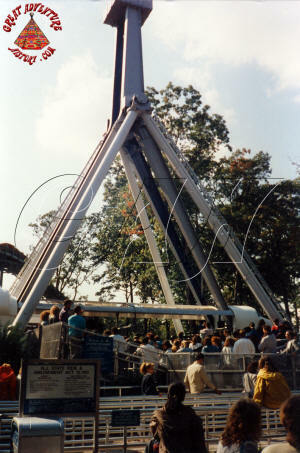 The ride followed in the footsteps of the INTAMIN swinging ship rides that Six Flags had rolled out to many of their parks in previous seasons. Like the swinging ship rides, it offered high capacity, reliability, and a visually exciting attraction as it took this thriling concept to the next level. 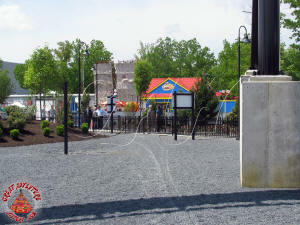 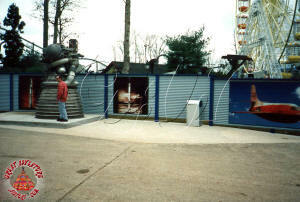 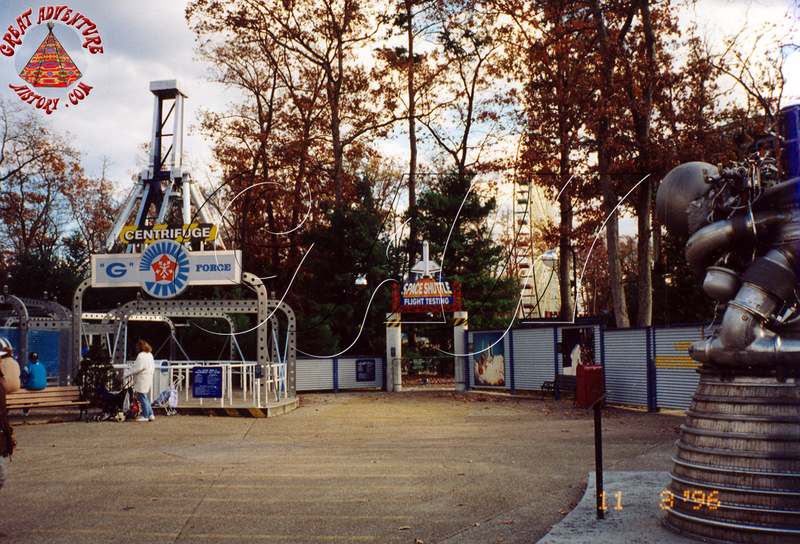 The ride was placed next to the Musik Express, across from the former location of the Haunted Castle which was left vacant by the end of the prior season. 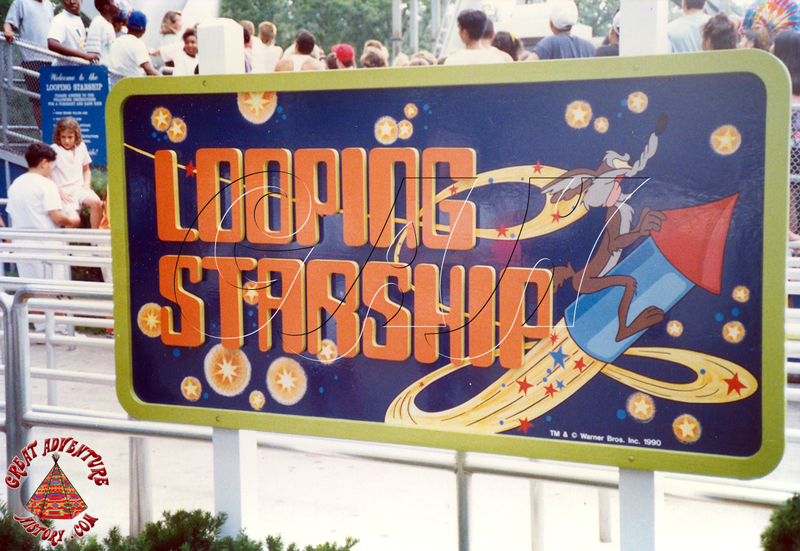 The Looping Starship easily drew riders and spectators as it was highly visible from the park's front gate. 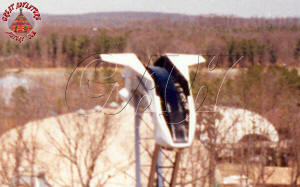 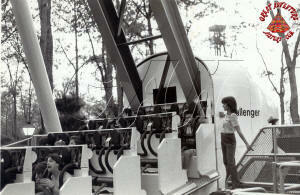 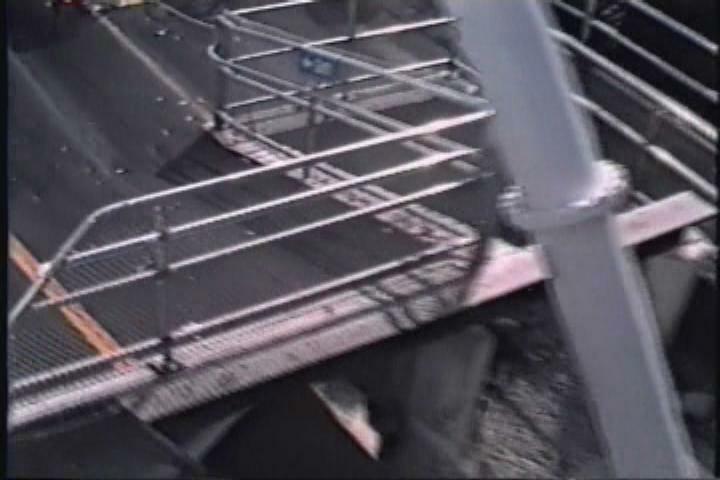 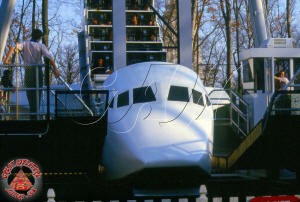 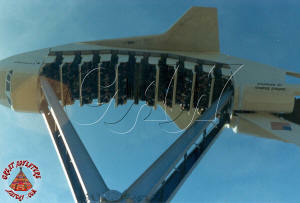 For the 1985 and 1986 seasons, Looping Starship operated without a protective screen over the passenger cabin. 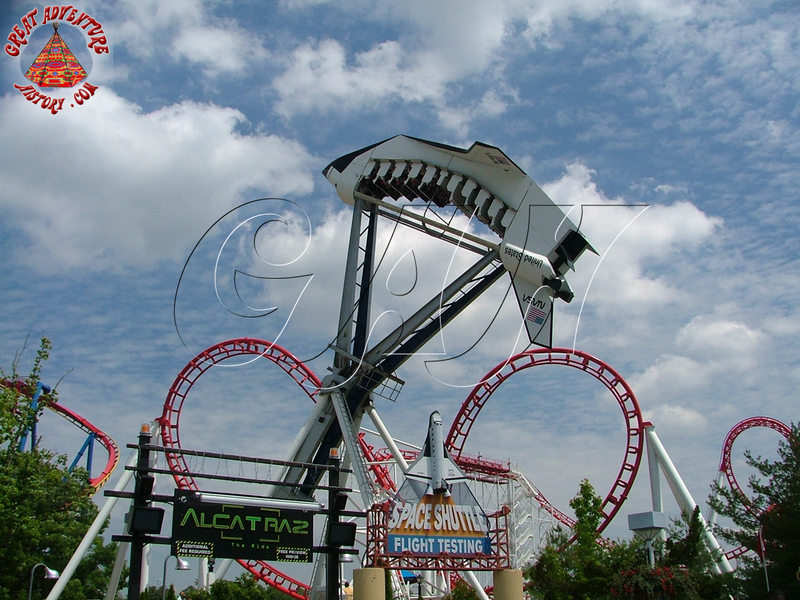 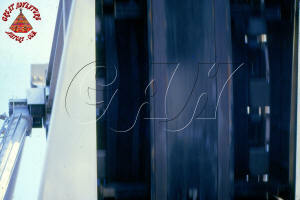 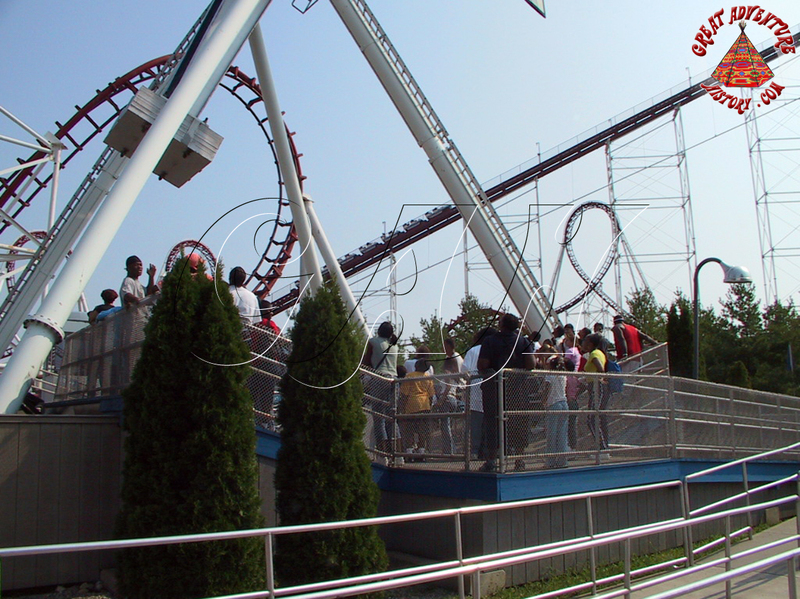 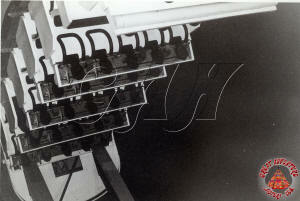 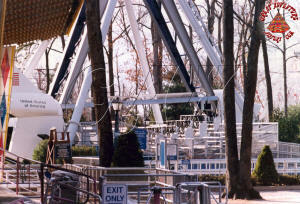 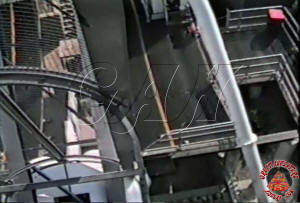 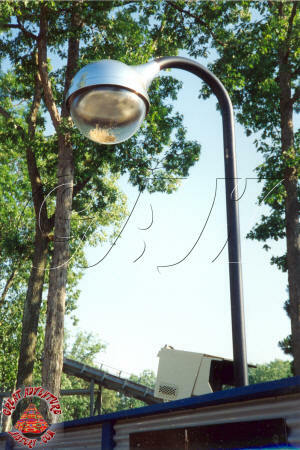 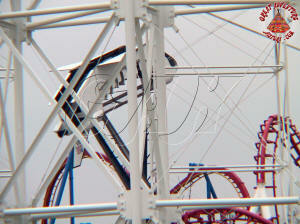 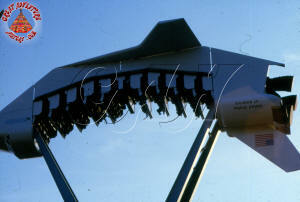 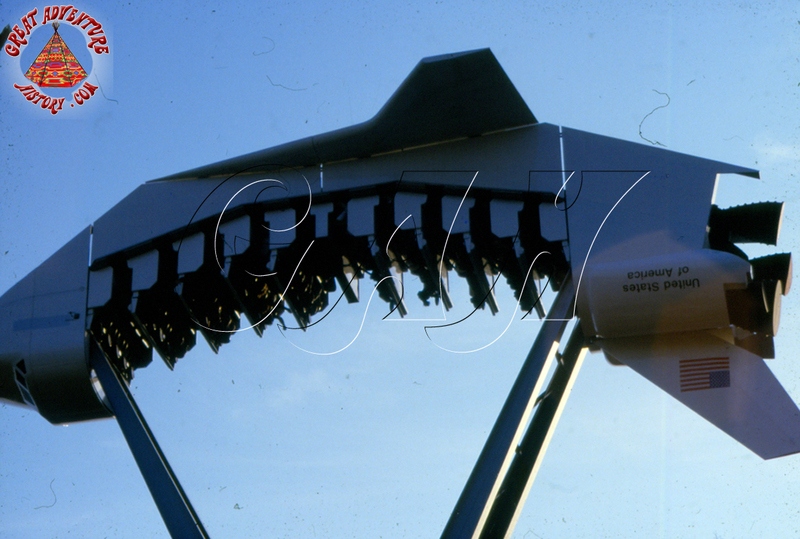 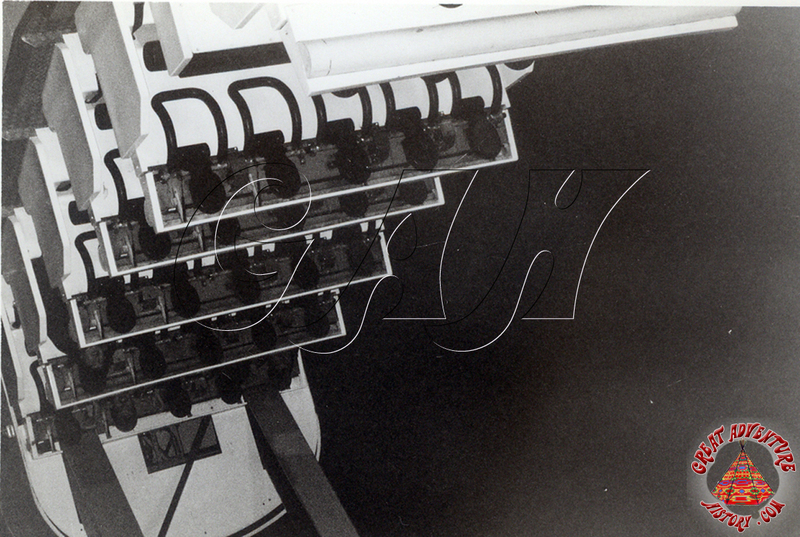 Quite often, rider's loose articles would drop out of the ride as it hung in the inverted position. 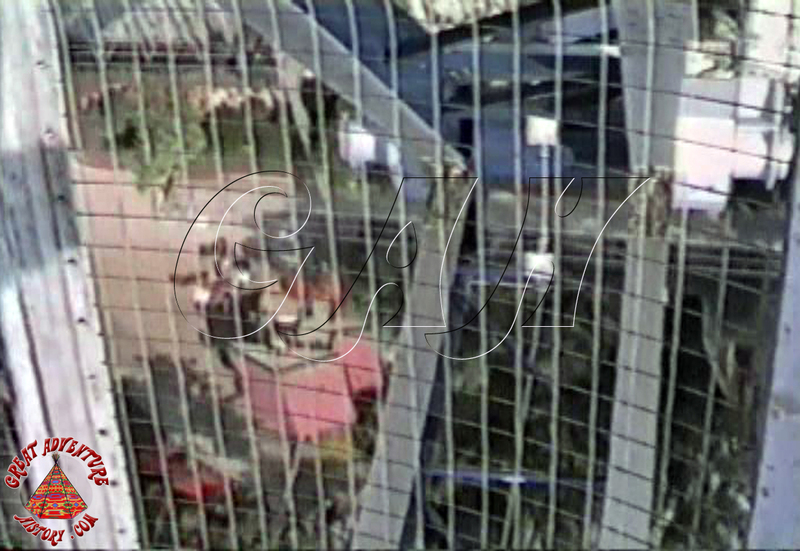 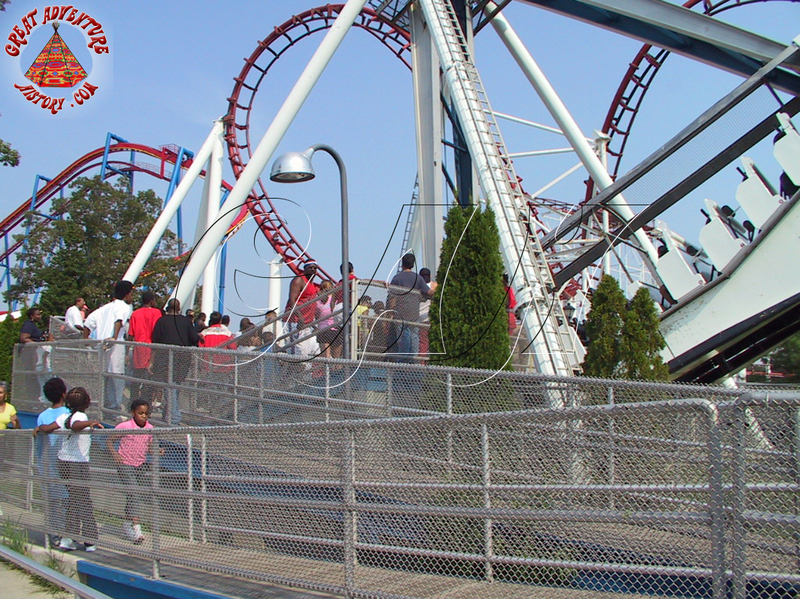 In 1987, a black net was stretched across the passenger compartment to catch falling objects, and in 1988 a rigid metal screen was added. 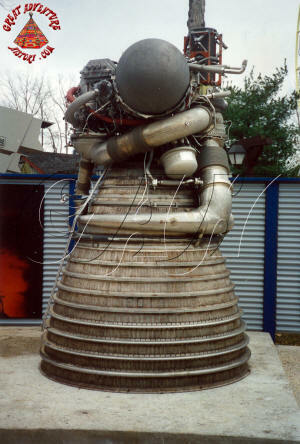 Another modification to the ride was the removal of the twin fiberglass "engines" attached to both back sides of shuttle body. 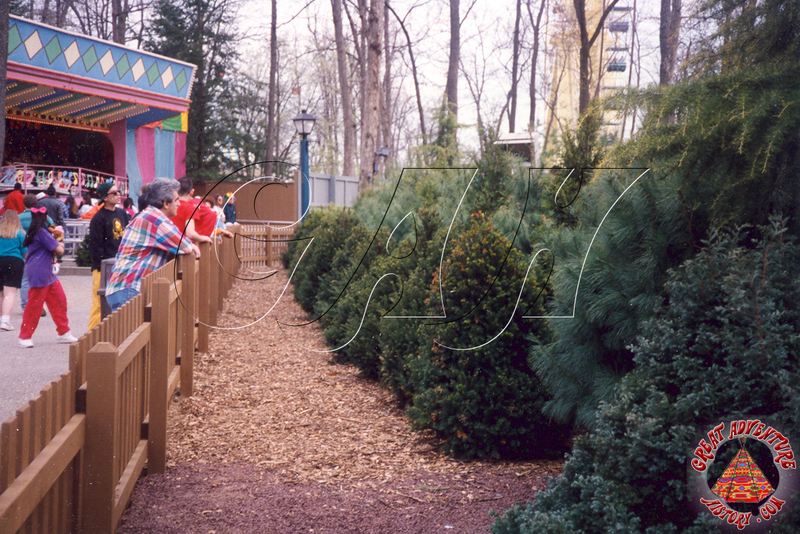 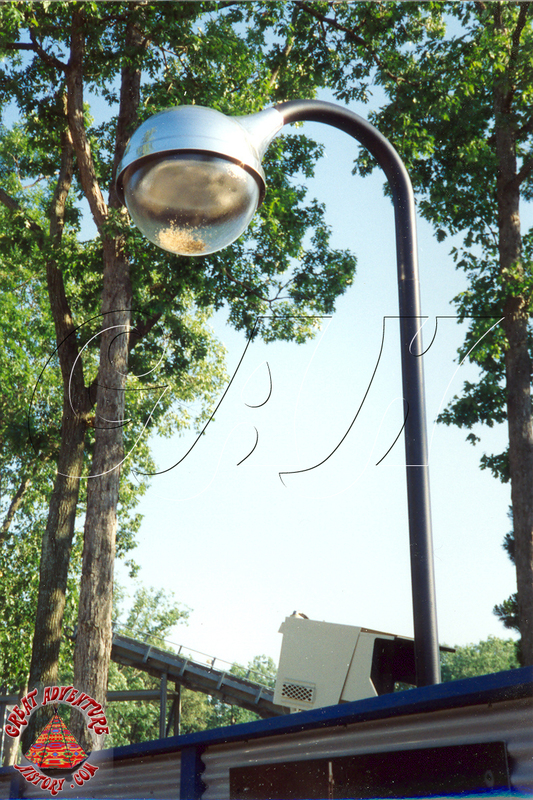 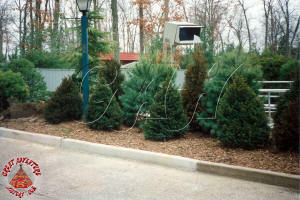 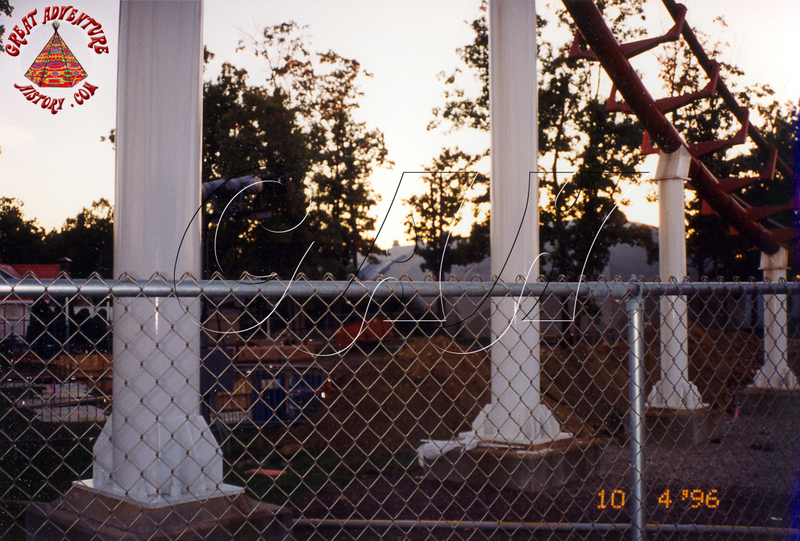 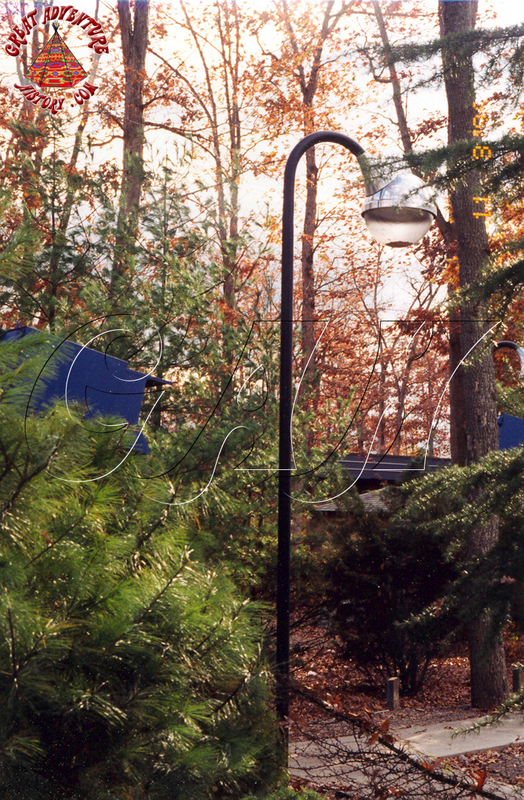 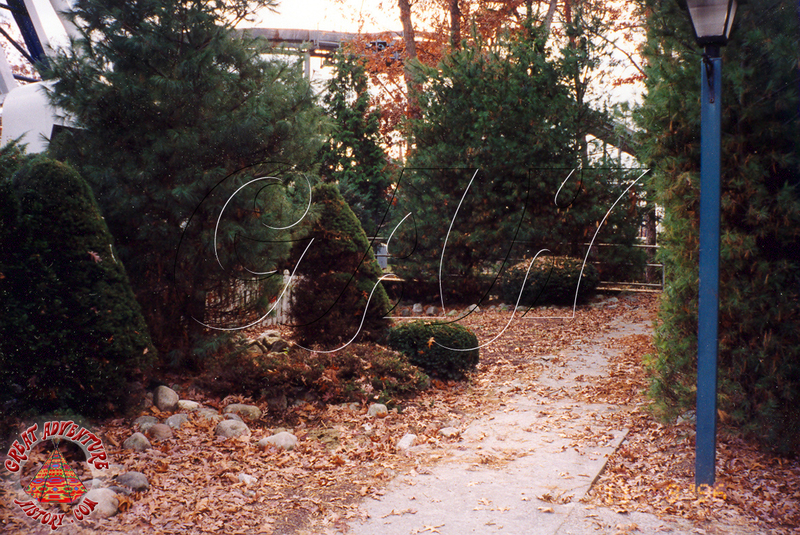 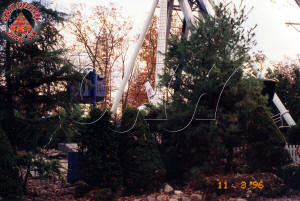 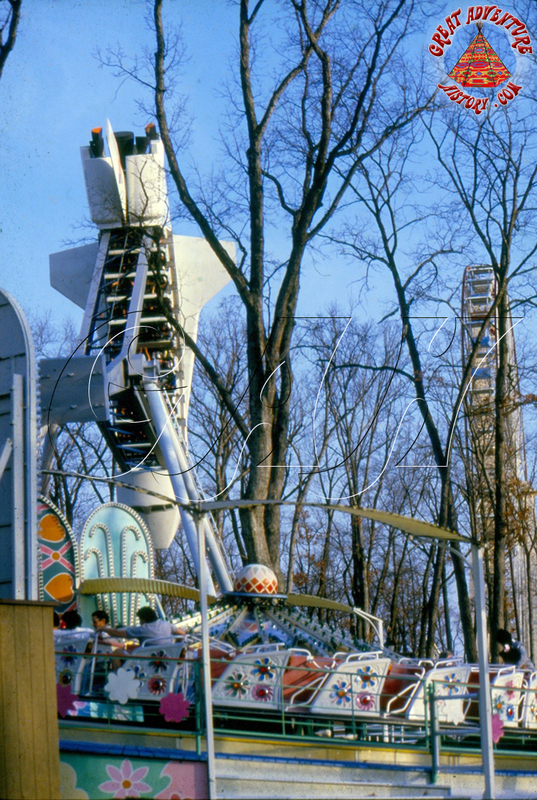 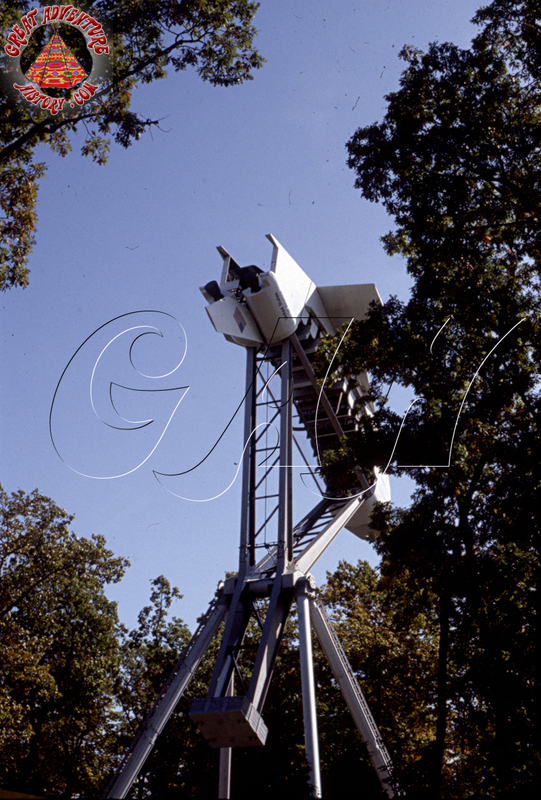 These hollow cones would vibrate as the ride cycled, and it was feared the vibrations would eventually shake them loose so they were removed during the 1986 season. 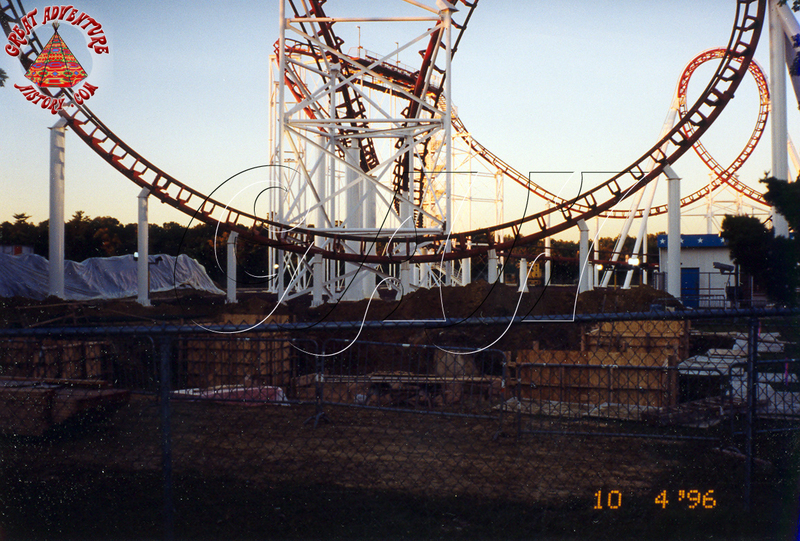 neck harnesses, and seat belts. 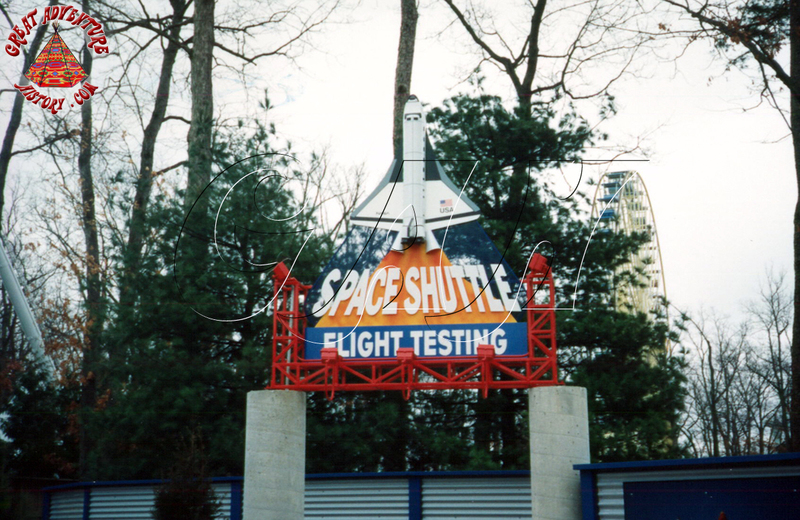 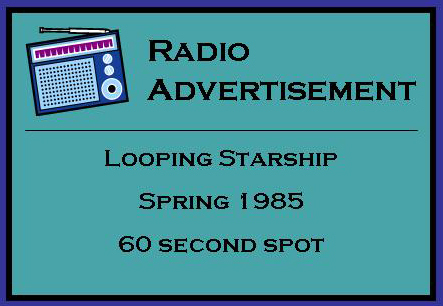 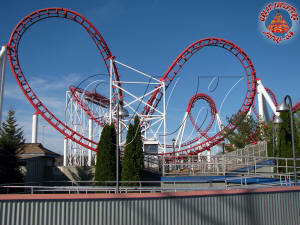 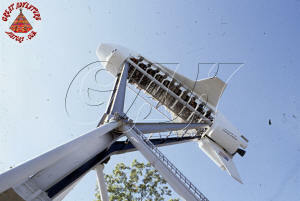 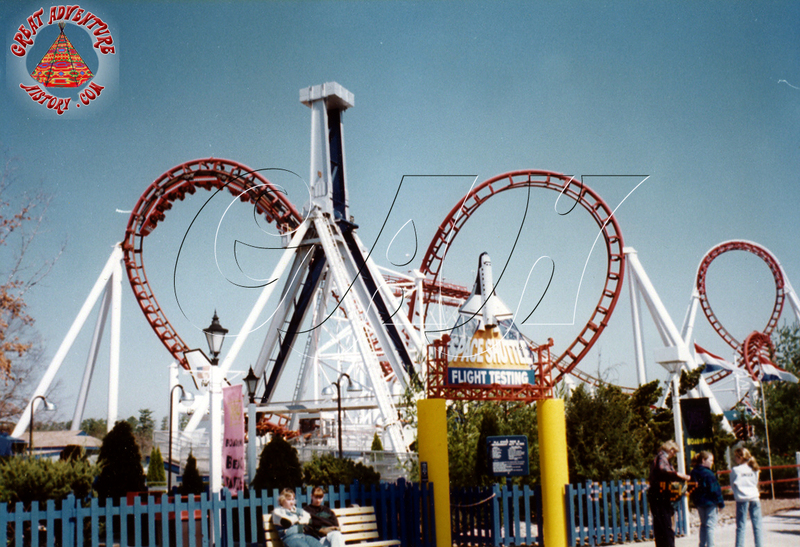 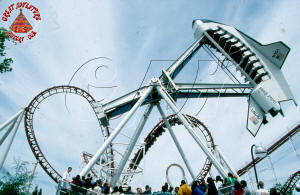 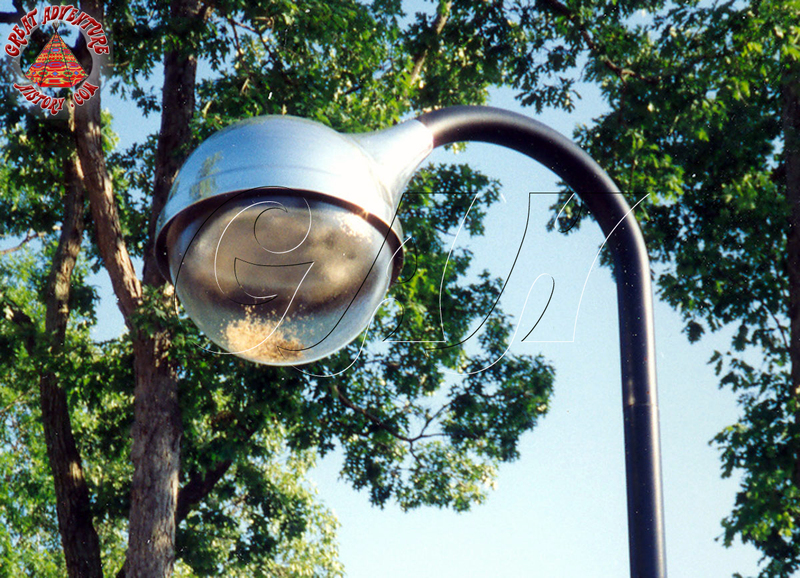 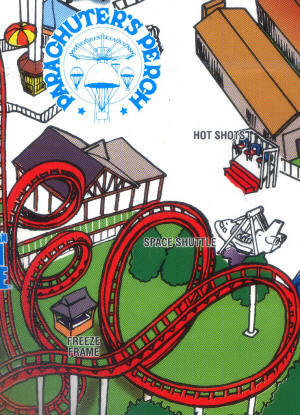 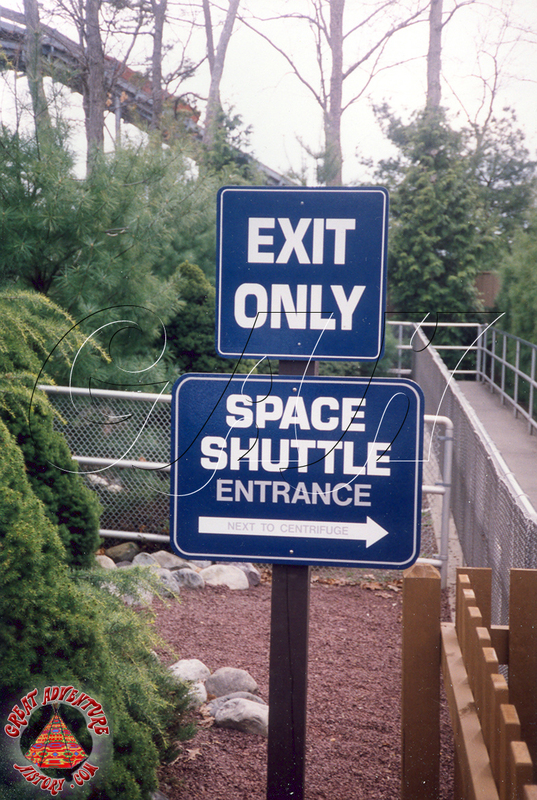 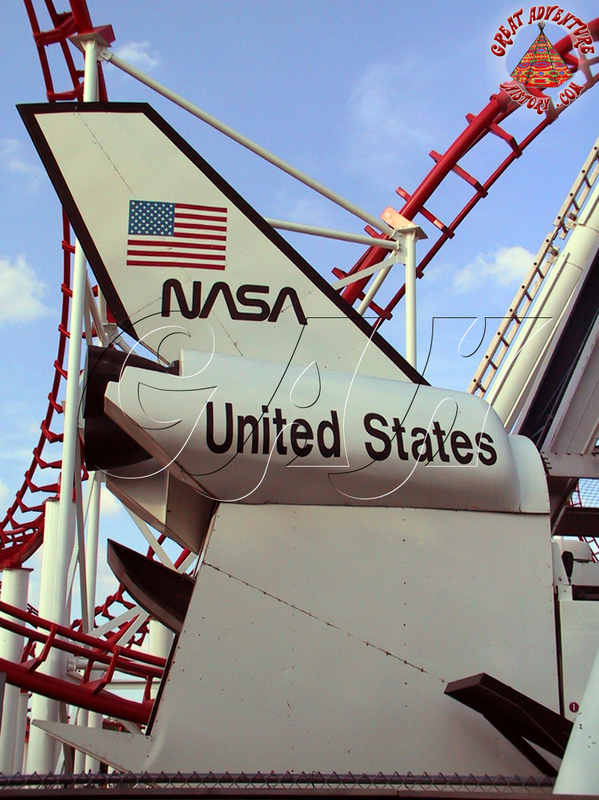 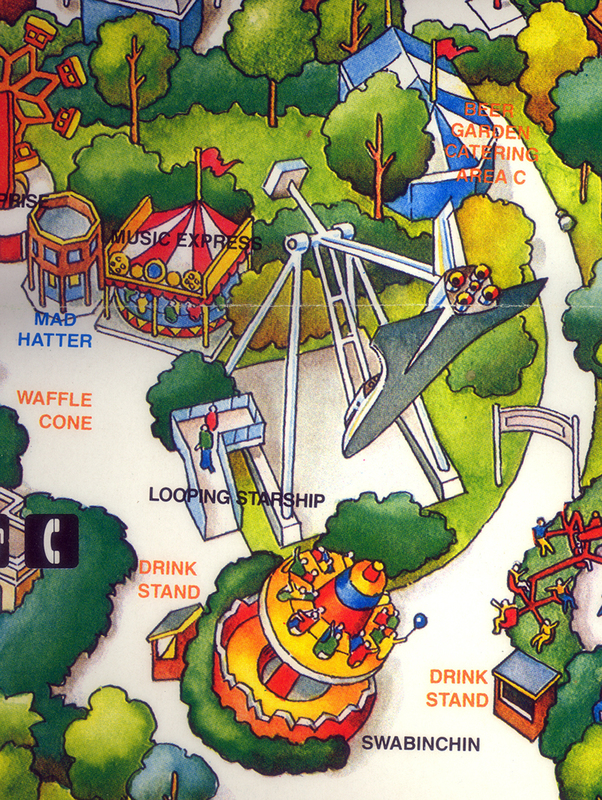 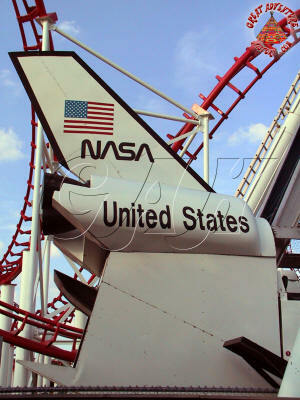 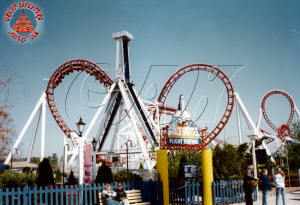 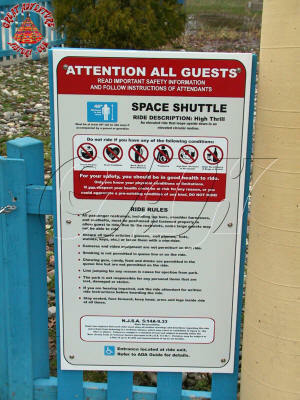 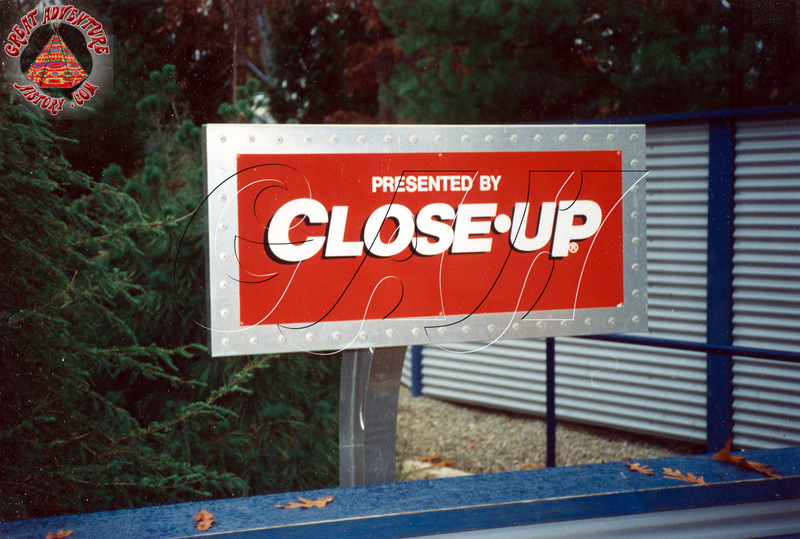 From 1985 to 1989, Looping Starship lacked any signature signage. 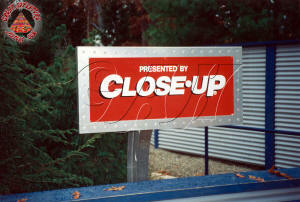 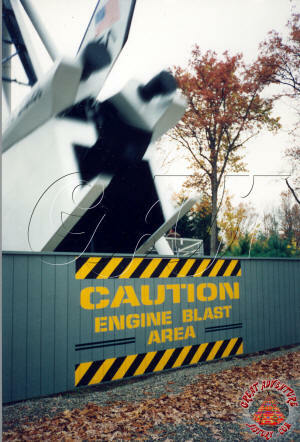 A Looney Tunes themed identifier was added for the 1990 season, and was in place until the end of 1992 when the ride was renamed and re-themed. 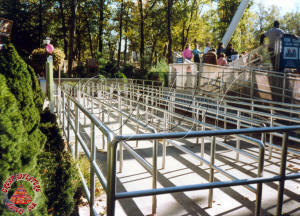 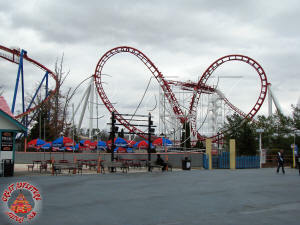 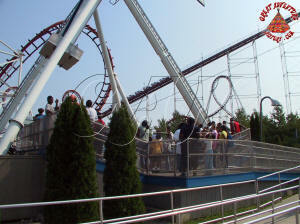 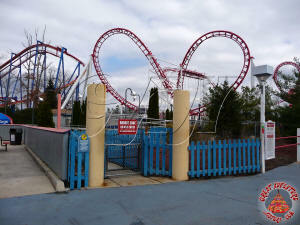 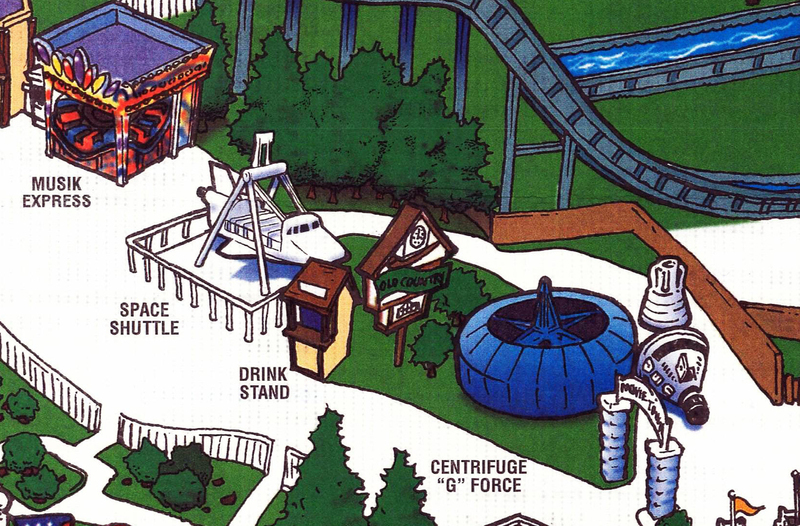 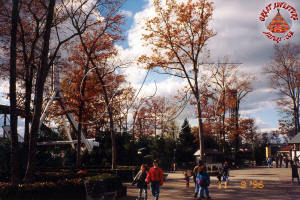 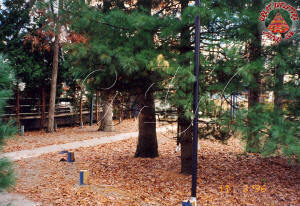 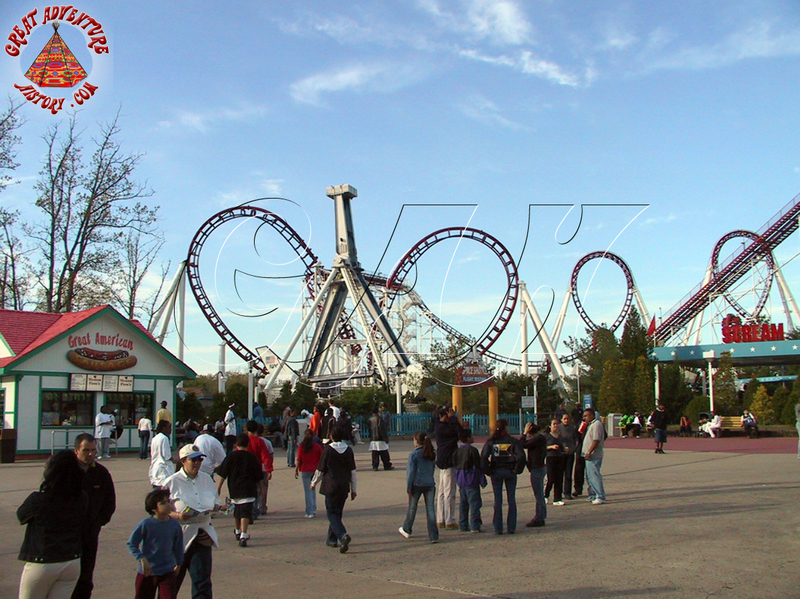 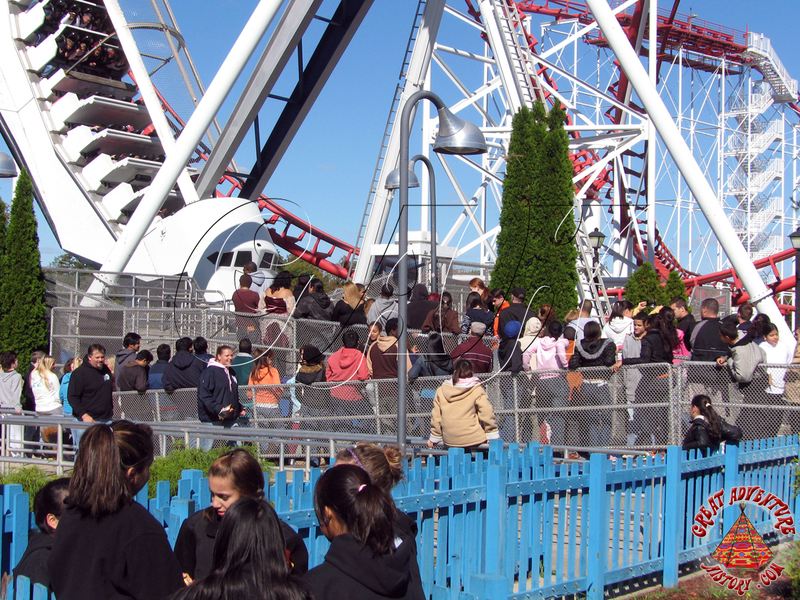 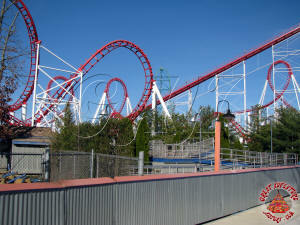 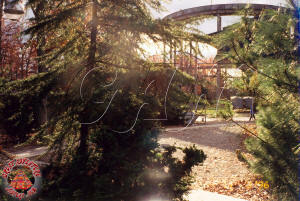 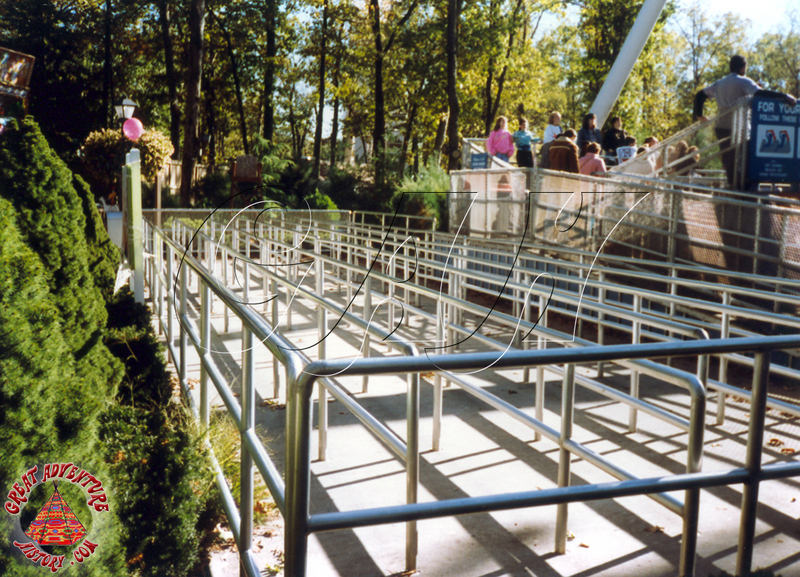 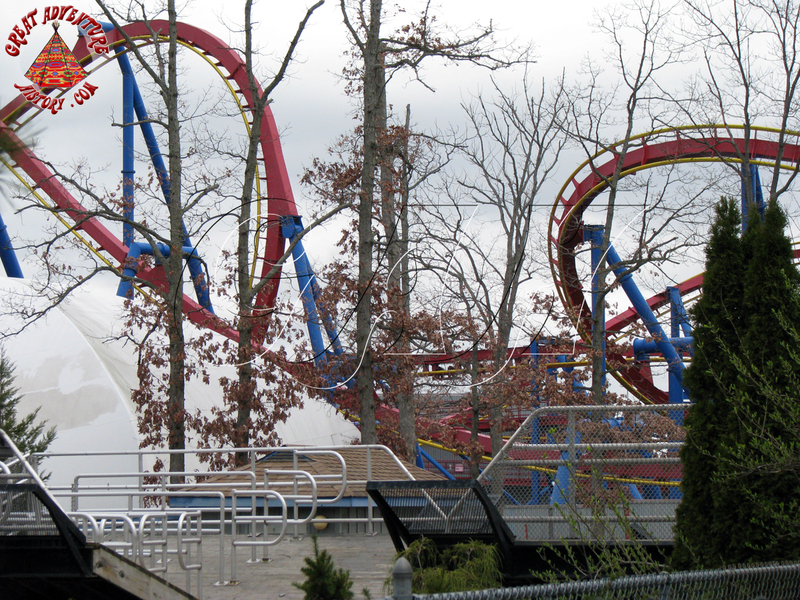 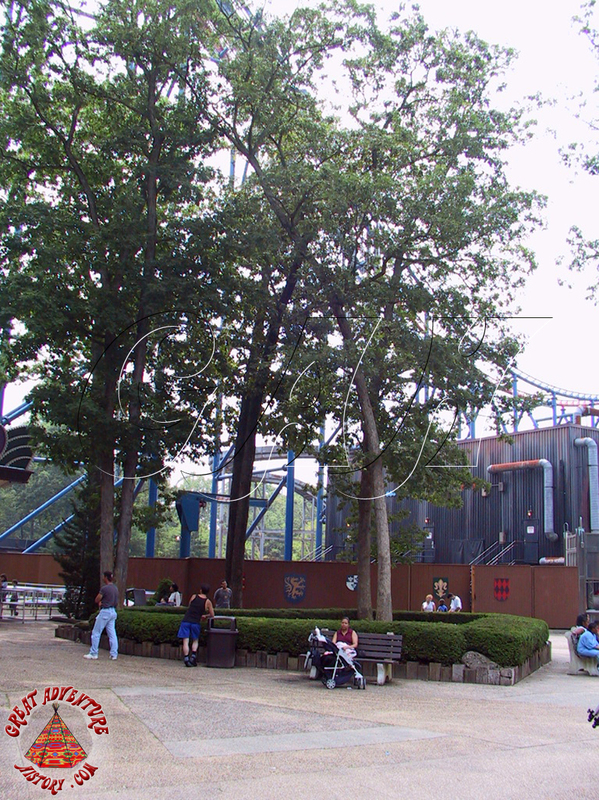 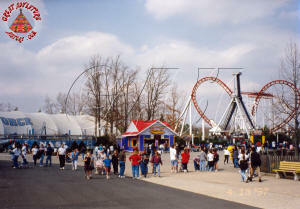 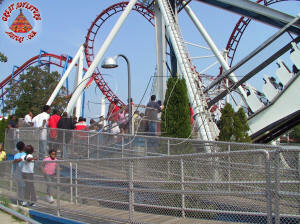 With Time Warner's purchase of Six Flags, a concerted effort was made to bring themes to areas of the park which were sometimes a hodge-podge of unrelated rides and elements. Physically located in an area of the park which was to become The Old Country, the Looping Starship's access was repositioned so the ride could be included in the neighboring Movie Town area. 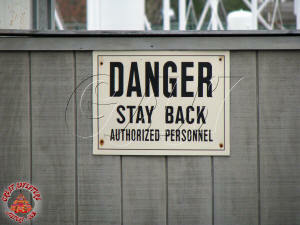 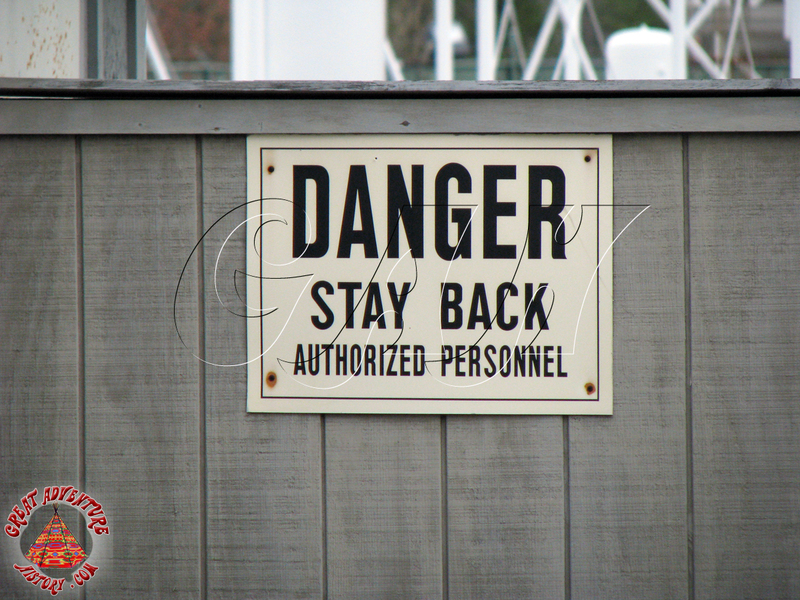 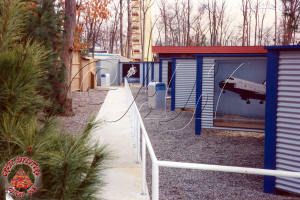 The queue line was rerouted with its entrance in the Movie Town section via a highly themed corridor located behind the ride featuring pictures including some from the Warner Brothers movie The Right Stuff. 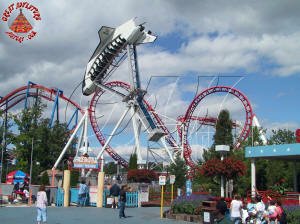 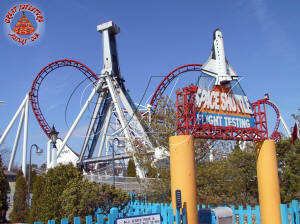 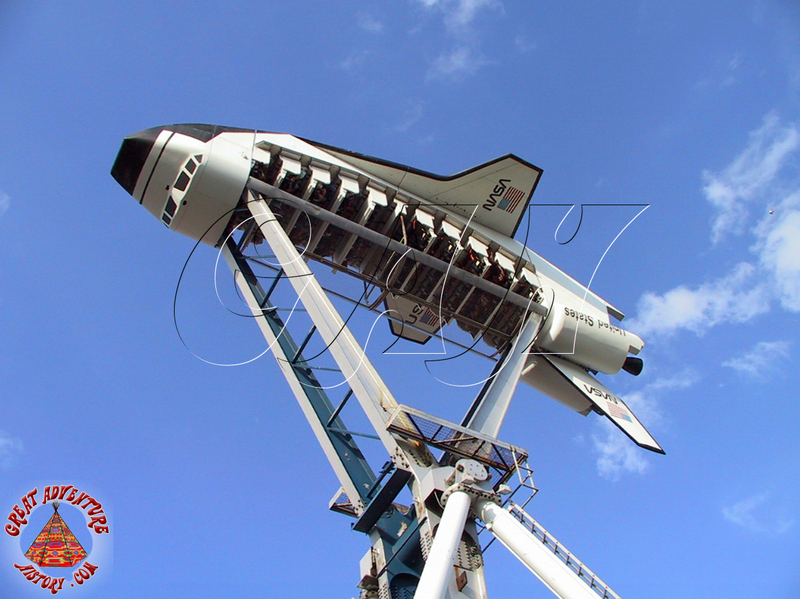 Together with the adjacent Scrambler ride which was rethemed to Centrifuge G-Force, the newly renamed Space Shuttle were given elaborate new lighting, fences, and other themed elements to enhance their ties to the film and create a space themed environment. The Space Shuttle was meant to be a flight testing device as its new futuristic entranceway proclaimed. 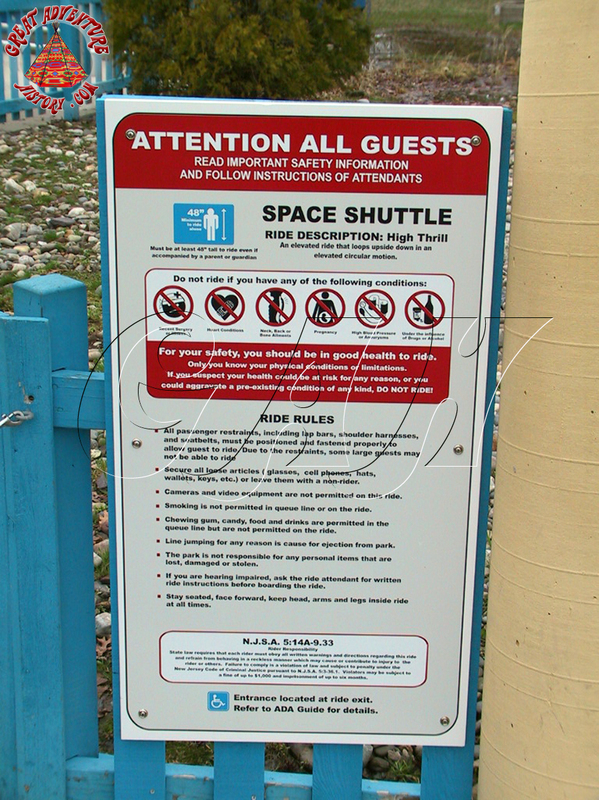 The new theme was even continued in details like the sponsor signs which were given a thematic overlay to further incorporate them into the surroundings. 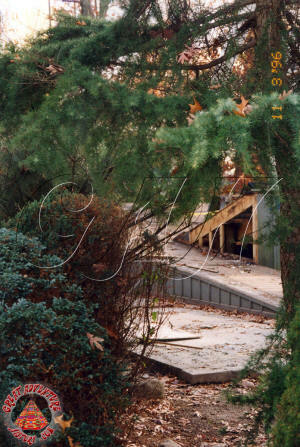 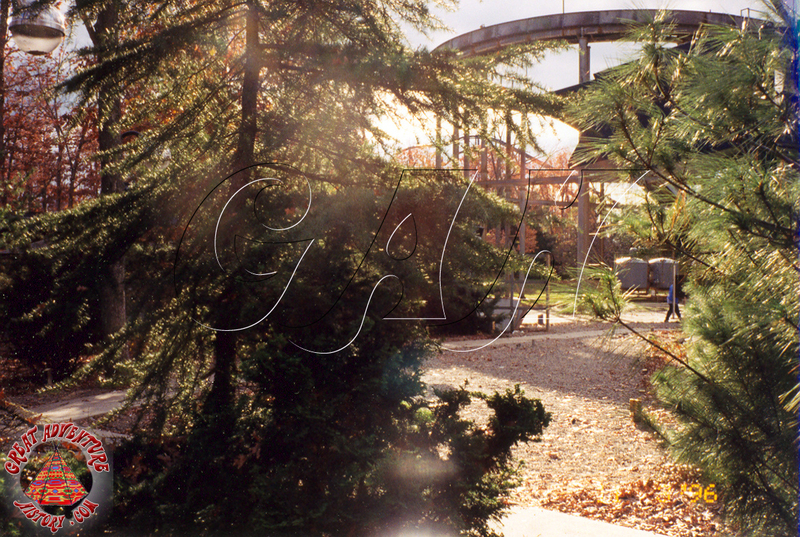 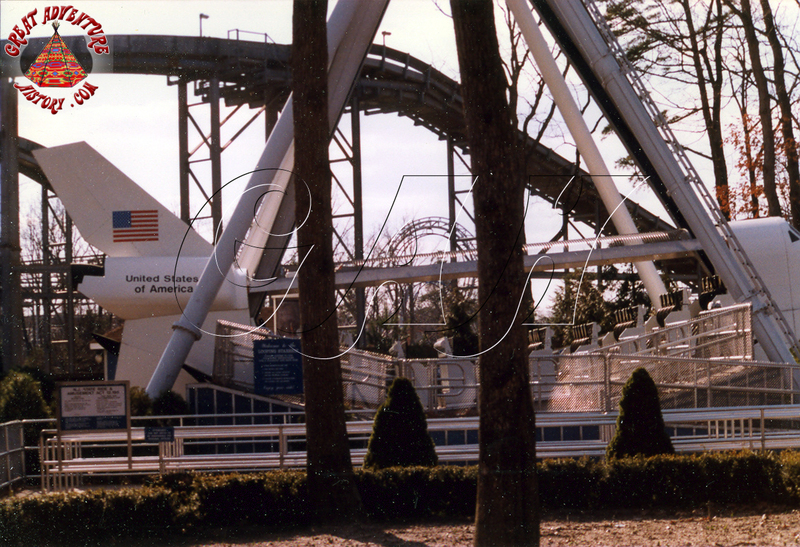 In the fall of 1996, the Space Shuttle was closed before the season ended and disassembly began for its eventual removal to the other side of the park. 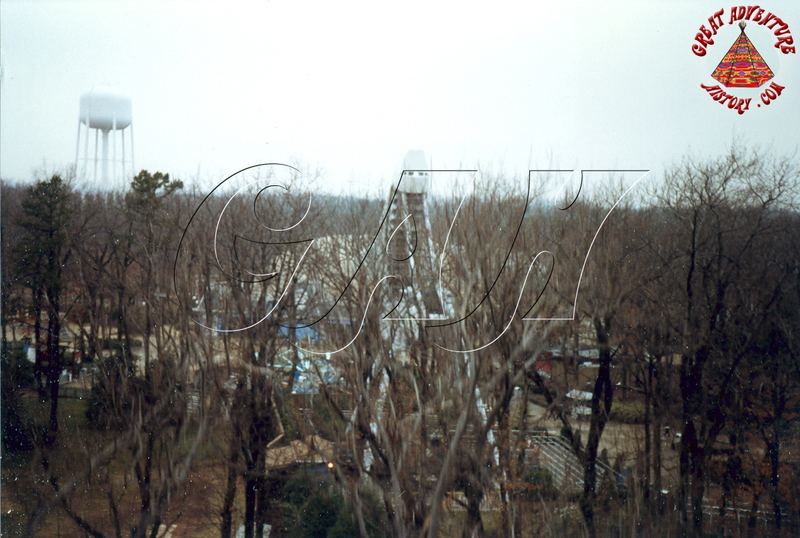 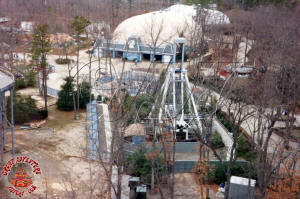 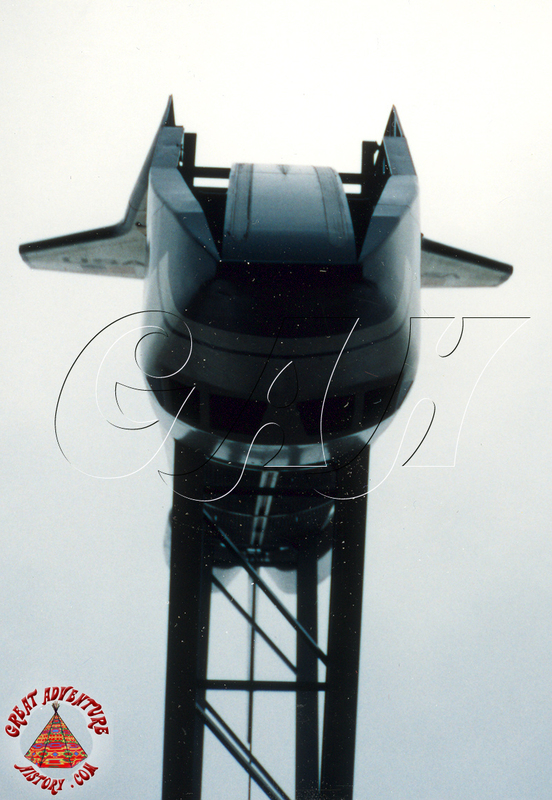 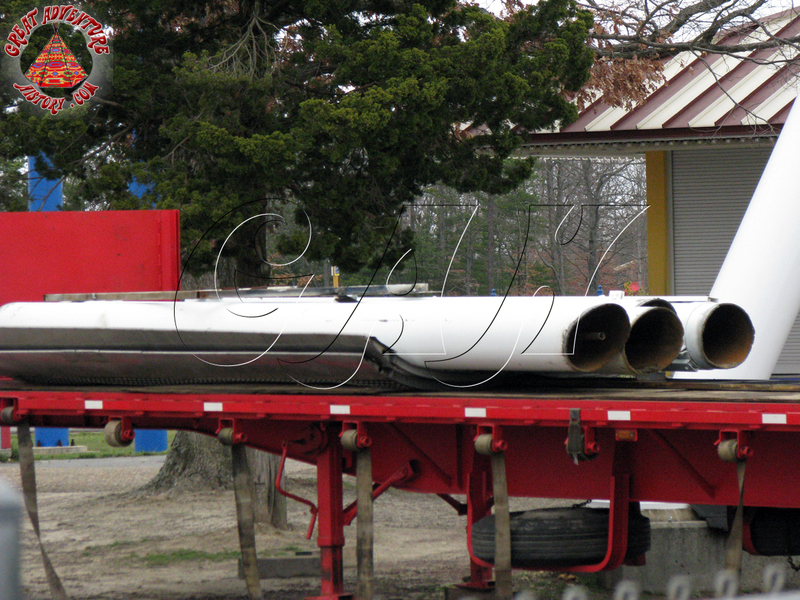 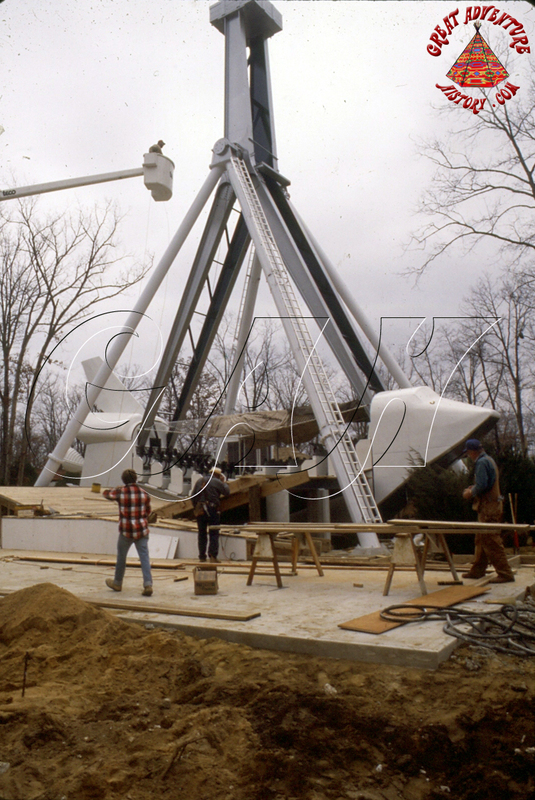 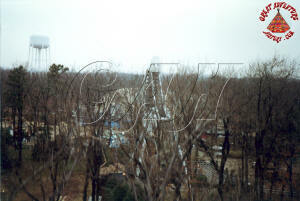 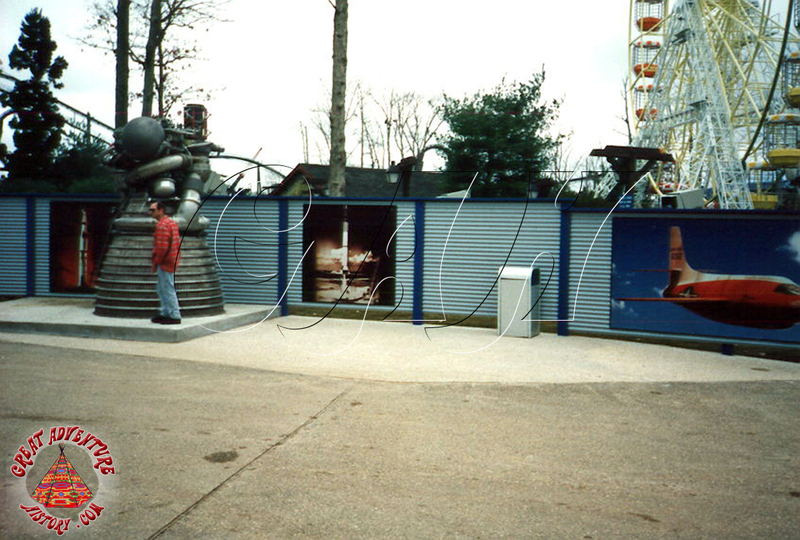 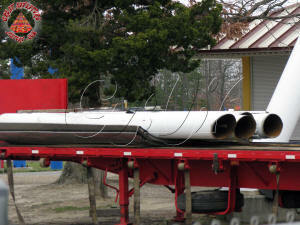 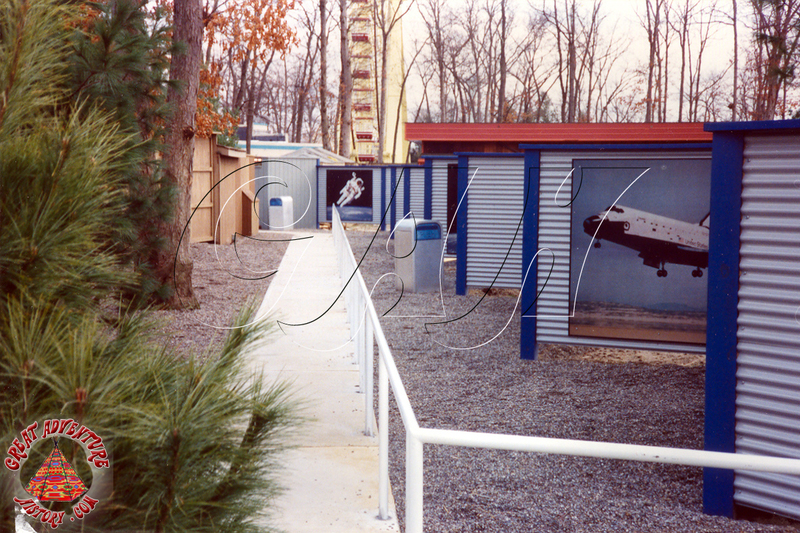 The Space Shuttle and Centrifuge G-Force (Scrambler) were being moved in preparation for the addition of Batman & Robin: The Chiller coaster for the 1997 season. 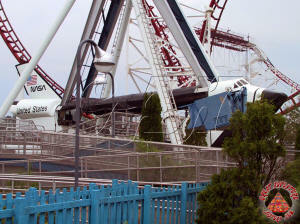 Both rides would be relocating to new homes at the top of the Boardwalk Area near the Right Stuff Mach 1 Adventure and the other flight themed attractions which were part of the Edwards Air Force Base area, a sub-region of the Boardwalk section. 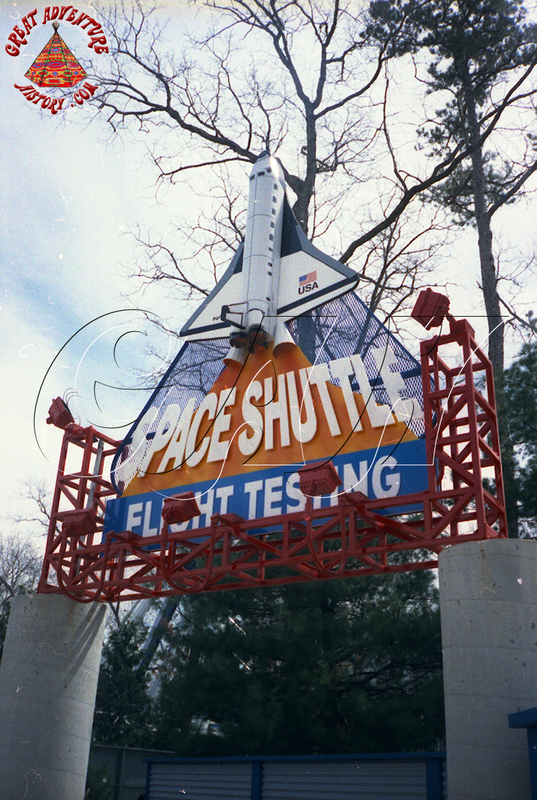 Also before the end of the 1996 season, site preparations had already begun for the Space Shuttle's new home. 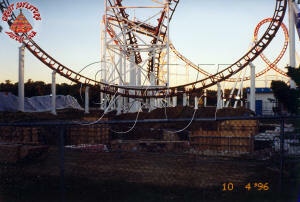 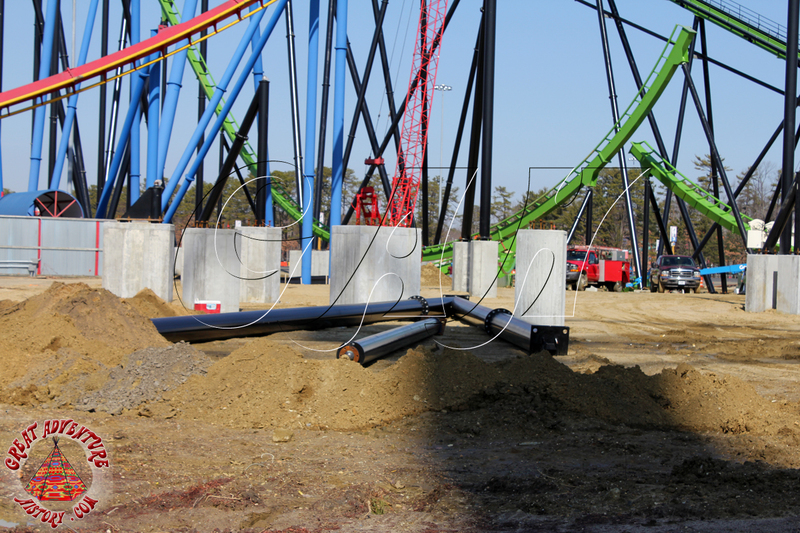 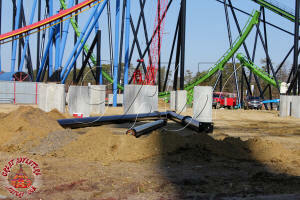 The massive footings and underground pit for the ride's drive tires were nearly completed before the final day of the season. 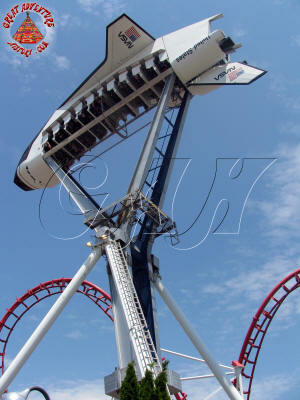 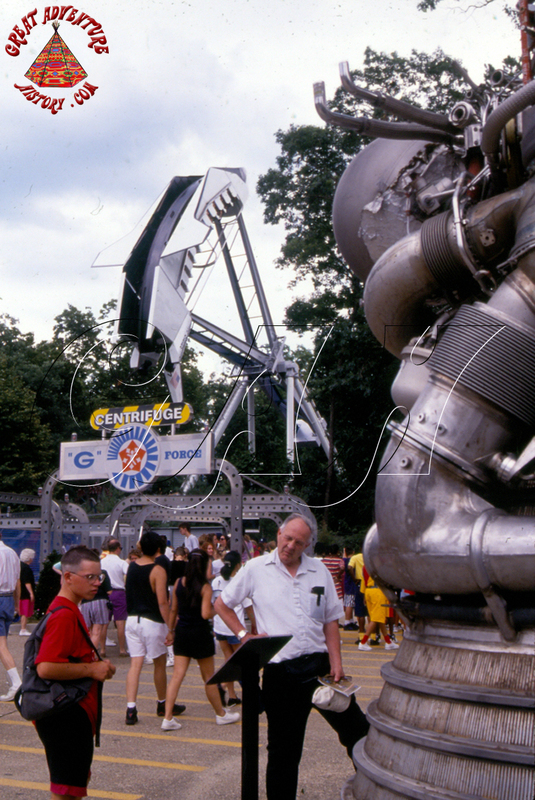 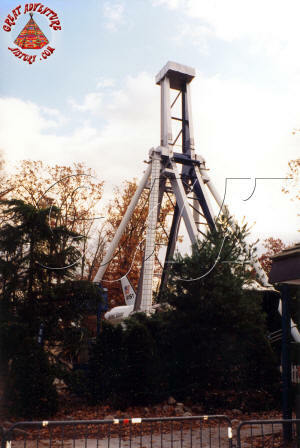 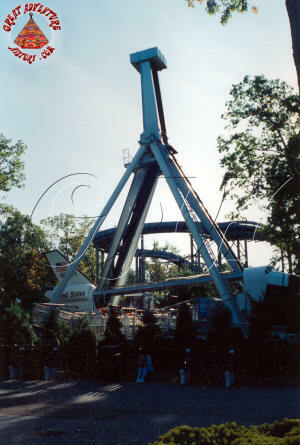 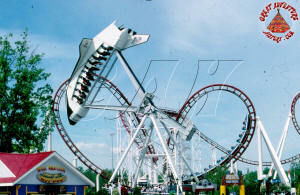 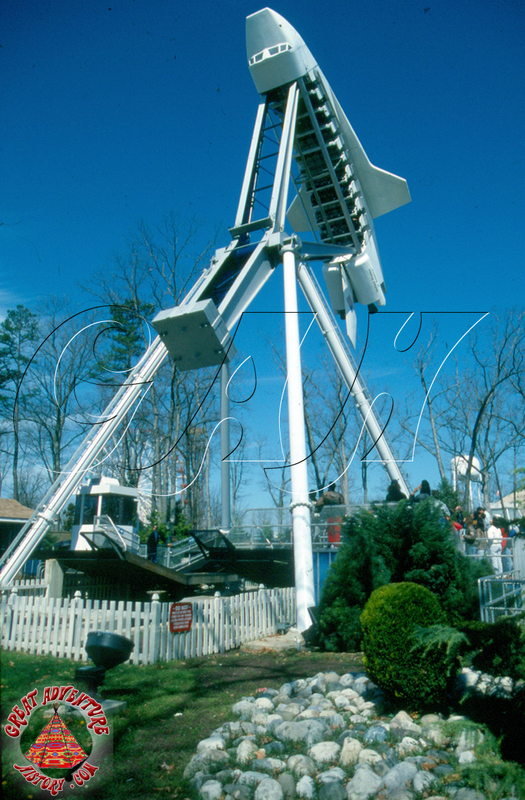 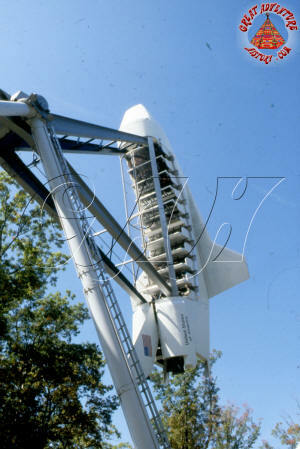 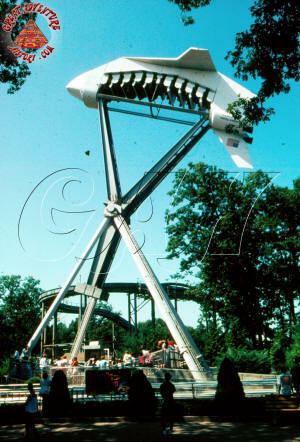 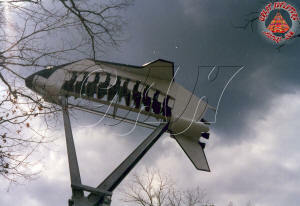 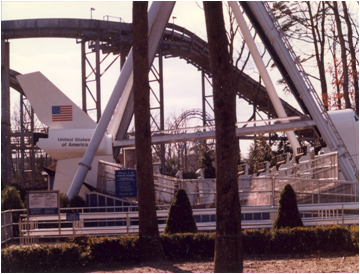 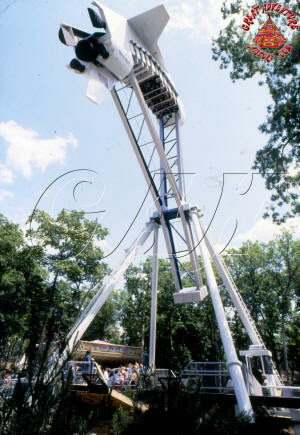 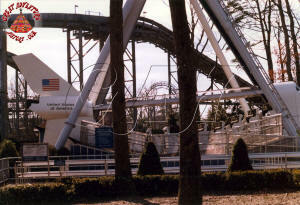 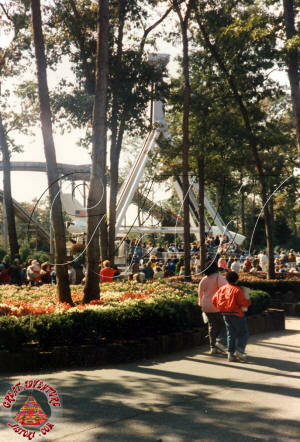 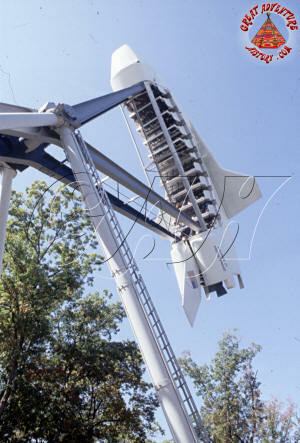 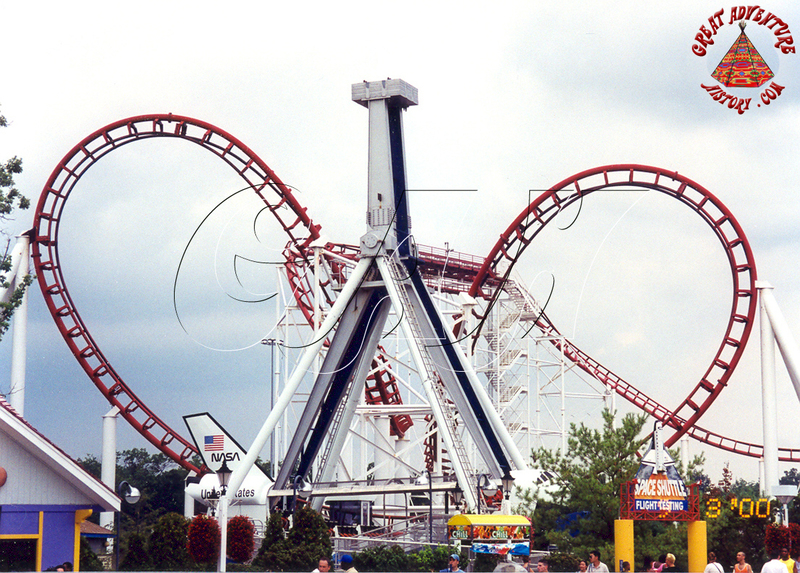 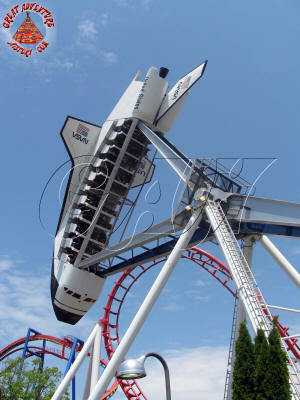 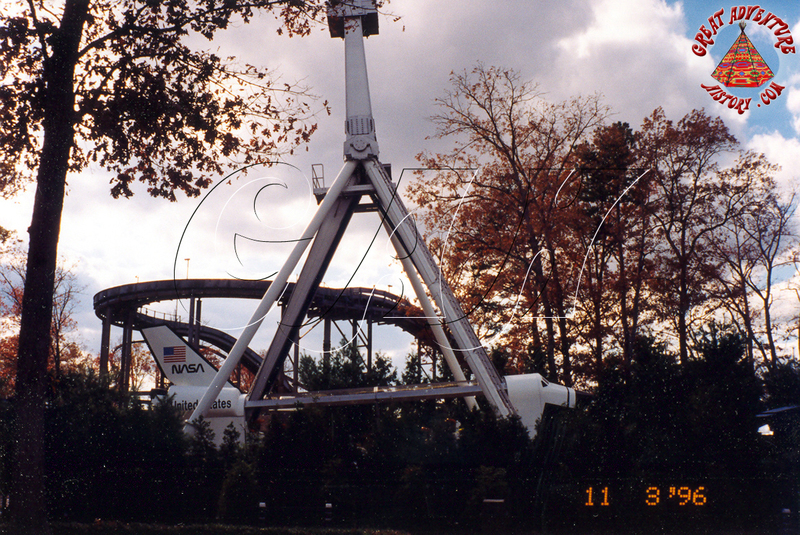 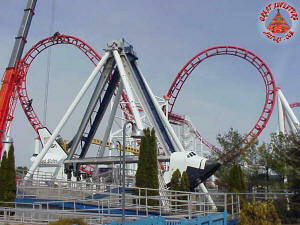 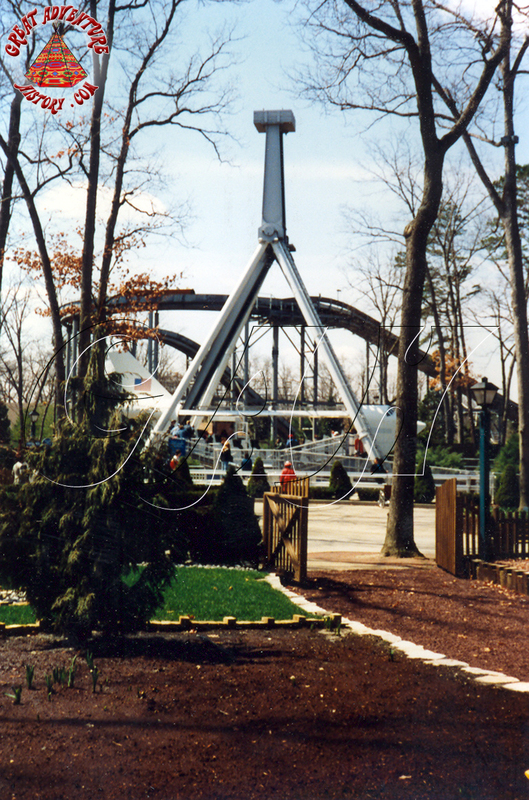 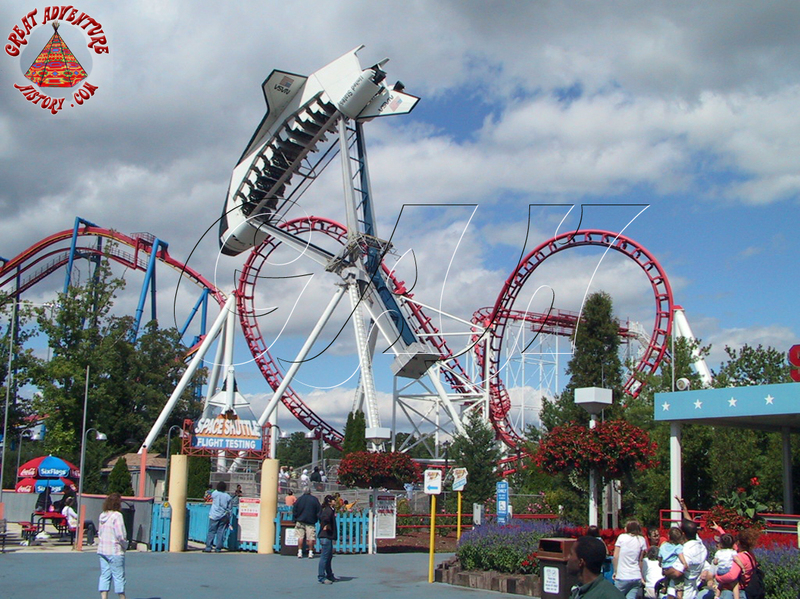 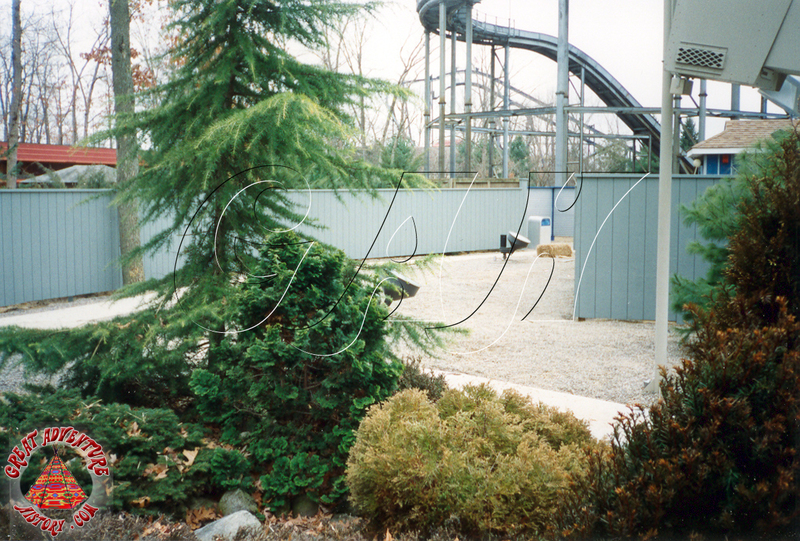 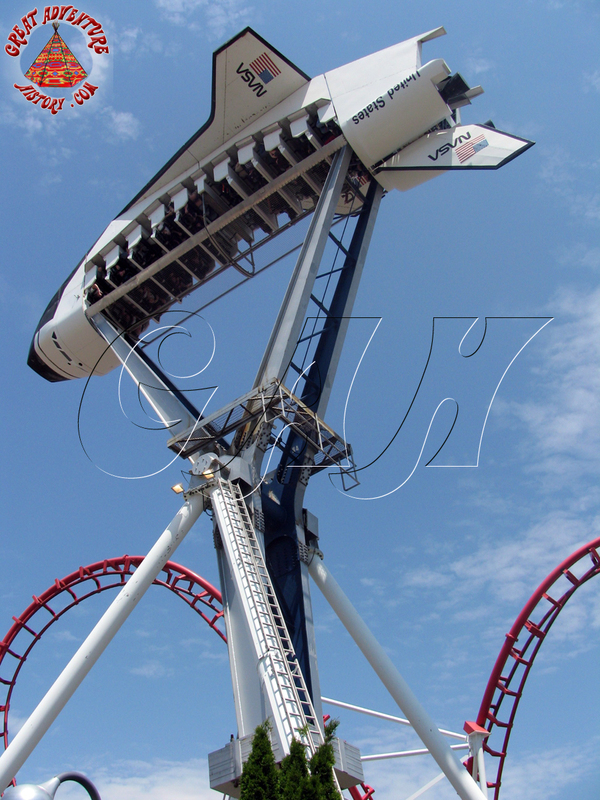 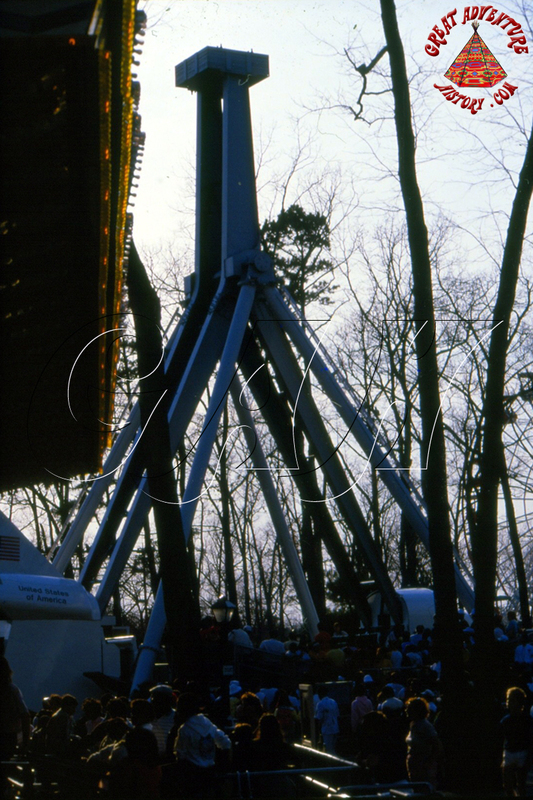 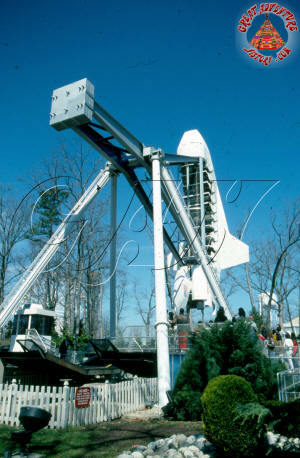 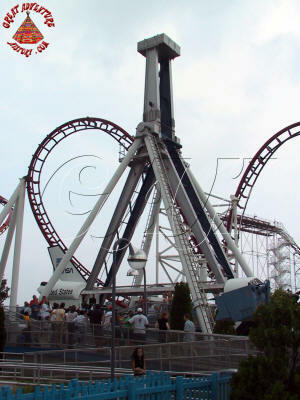 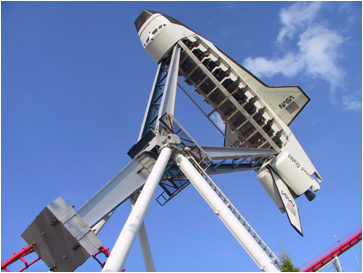 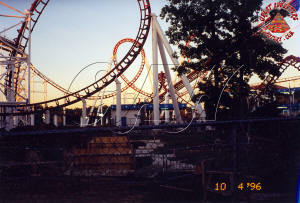 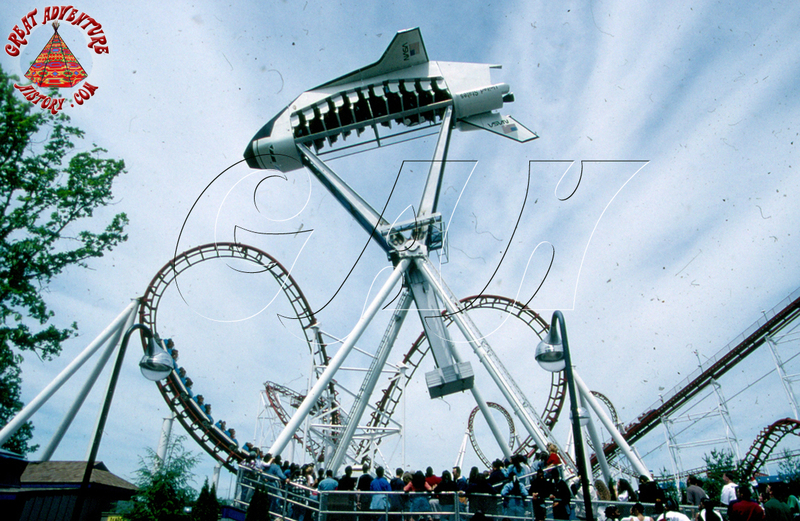 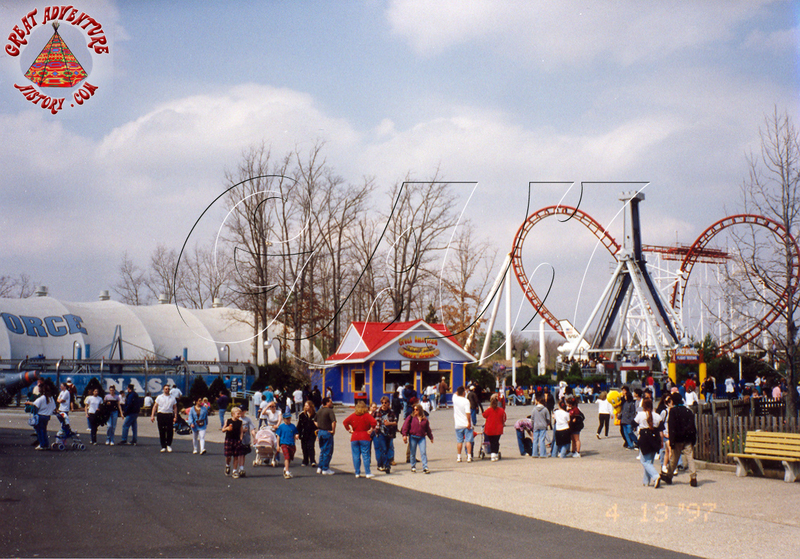 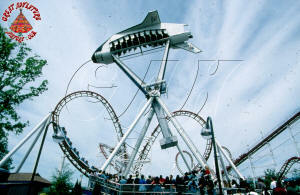 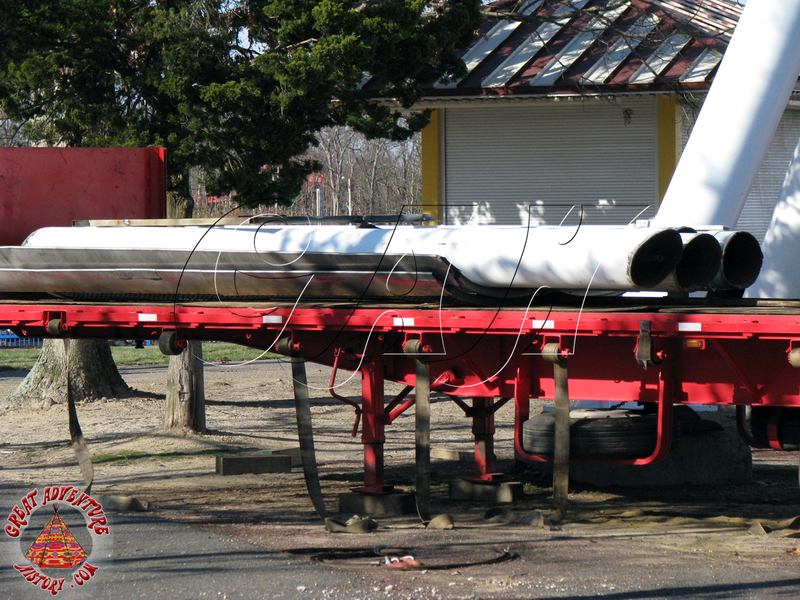 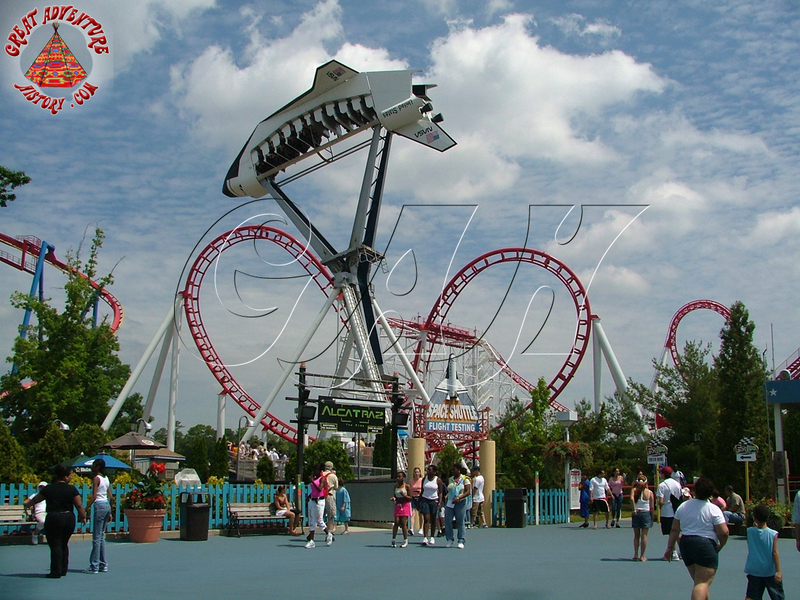 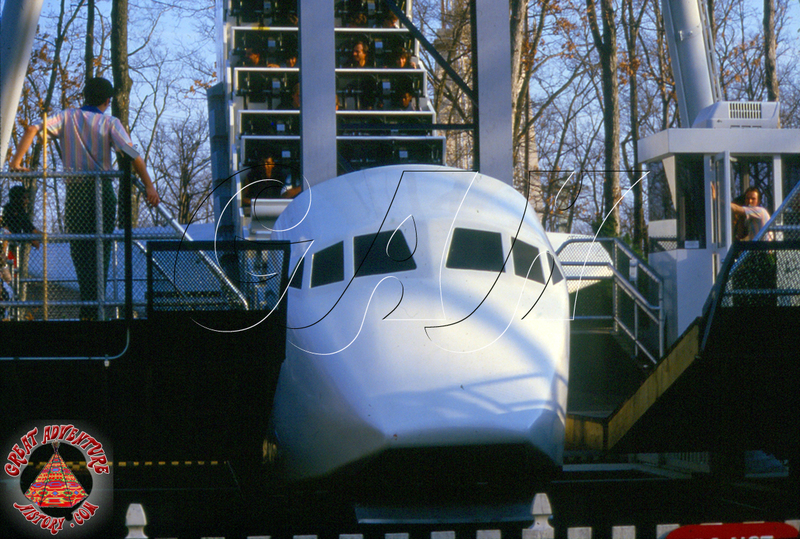 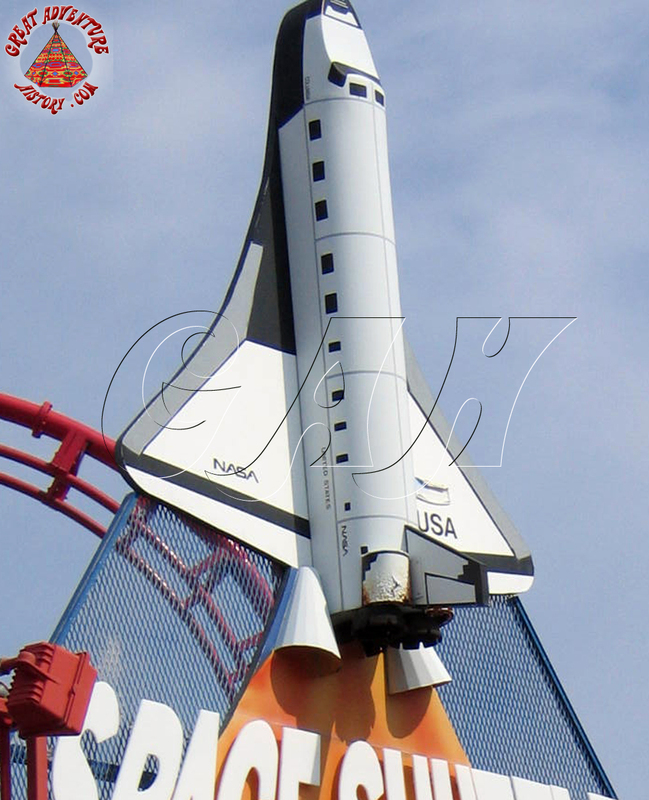 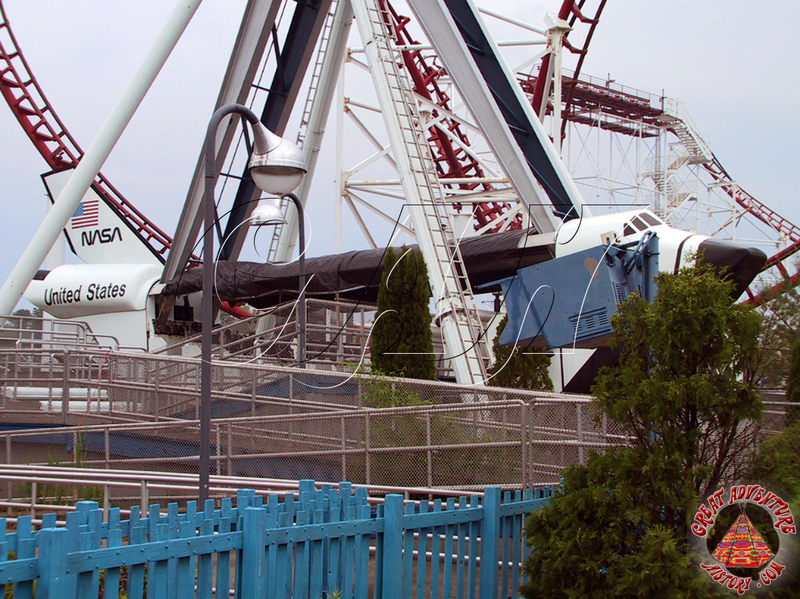 By opening day of 1997, the Space Shuttle had been re-assembled and was operating in its new local, framed by the boomerang element of the Great American Scream Machine. 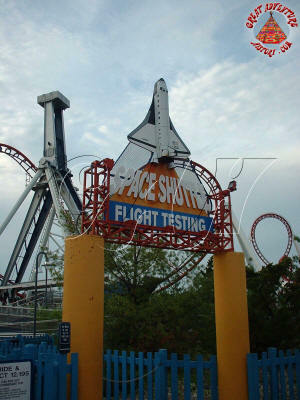 The Space Shuttle's new location made the ride very popular. Guests entering the parking lot could easily see the massive shuttle orbiting on the edge of the park and the higher traffic Boardwalk area guaranteed that guests would be waiting to board the next shuttle mission. 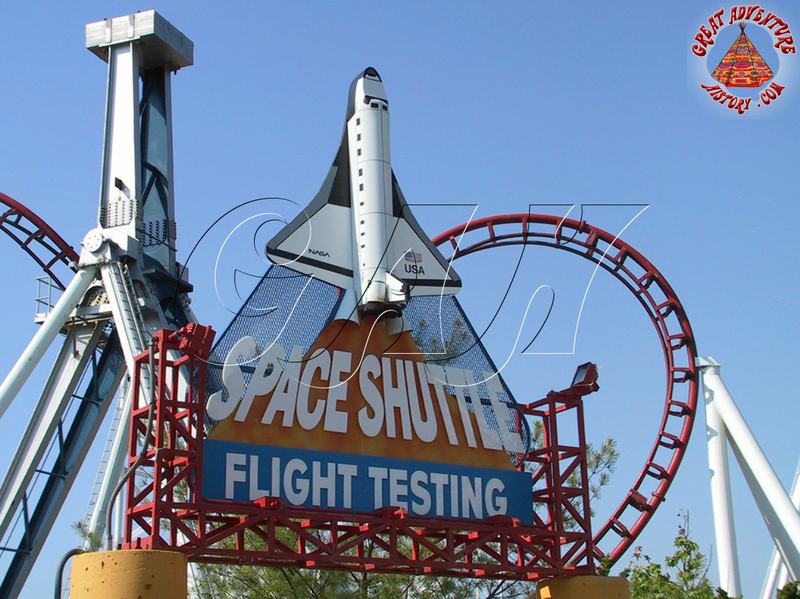 Unfortunately, time was not on the Space Shuttle's side as the ride approached its two decade milestone of continuous operation. 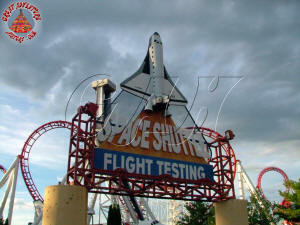 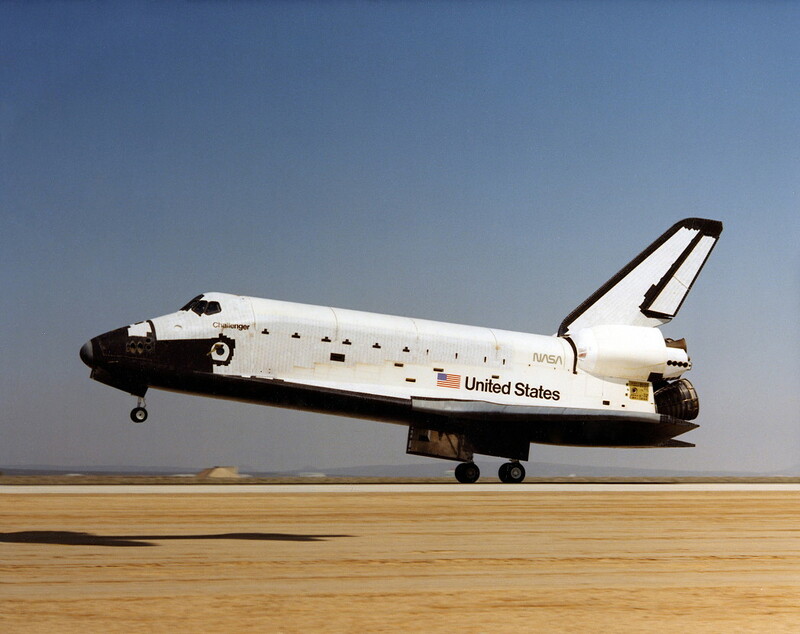 Over the years, the Space Shuttle had been through several extensive rehabs, often being closed for long stretches. 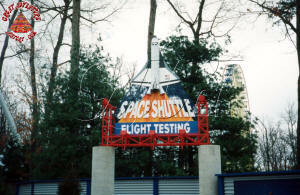 For the 2004 season, the Space Shuttle sat dormant for the entire season while refurbishment alternatives were being evaluated. 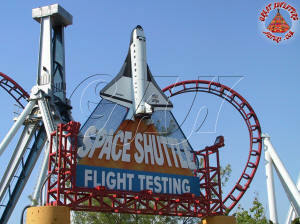 Unlike on a rollercoaster, the Space Shuttle's slow moving spacecraft made huge slow-motion arcs which left guests relying on its safety devices to hold them into place while they were hanging upside down. The safety features included seat belts, lap bars, and neck harnesses, all of which were maintenance nightmares as the ride aged. 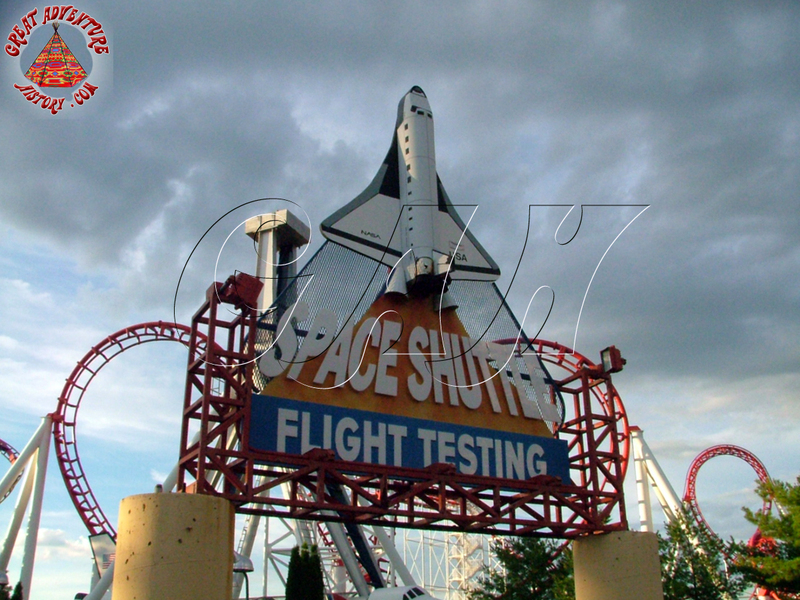 The Space Shuttle returned to service for 2005, but in its remaining seasons ahead would often stay closed for days or weeks at a time anchored to its launching pad. 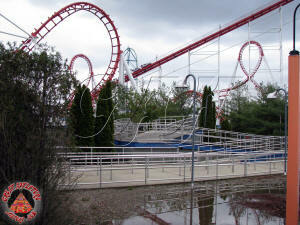 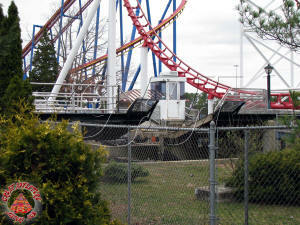 The ride made its last mission in 2007 and was retired from the Great Adventure ride fleet that summer. 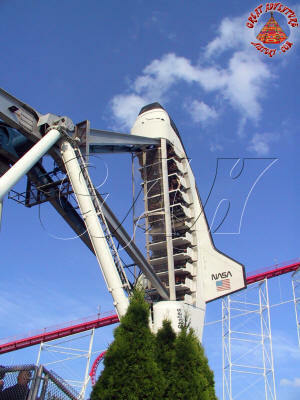 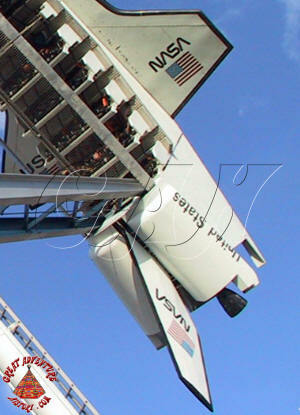 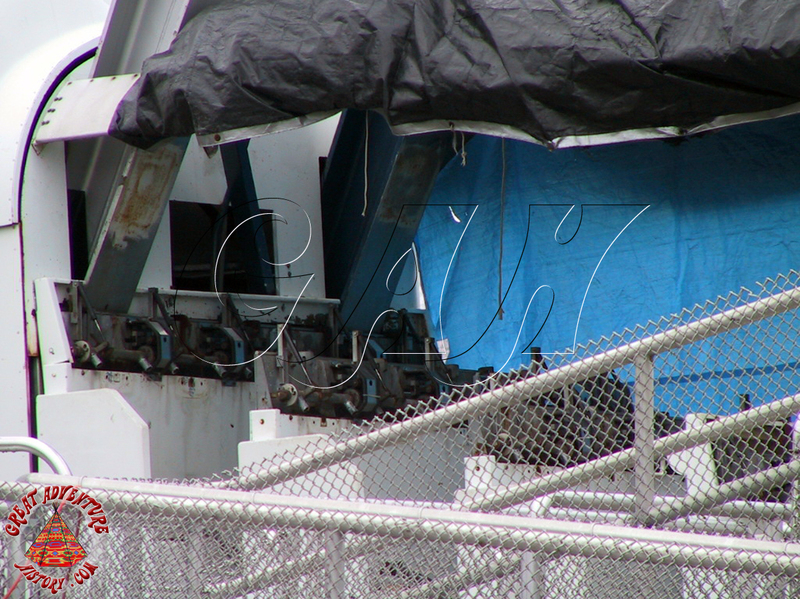 During the 2007-2008 off season the Space Shuttle ride was disassembled and cut up for scrap. 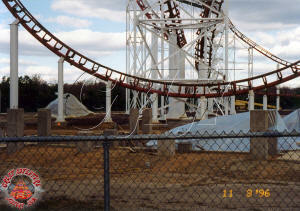 The ride went straight to the junkyard, bypassing the park's often used boneyard. 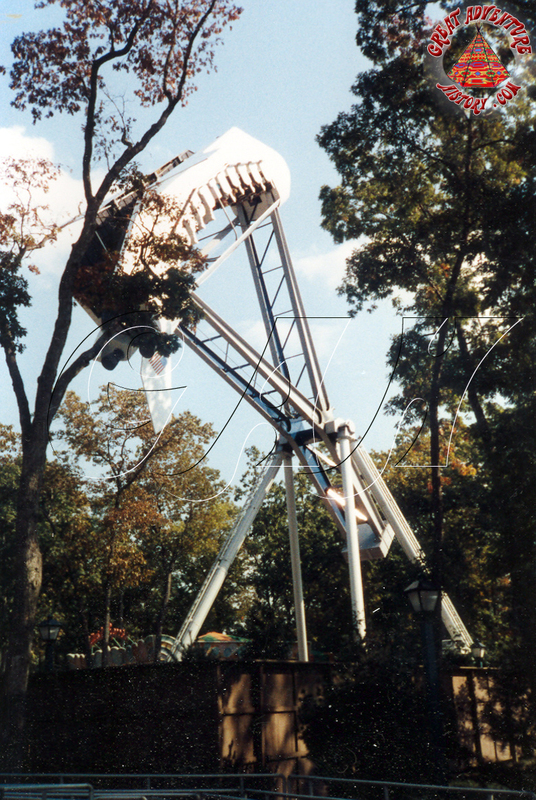 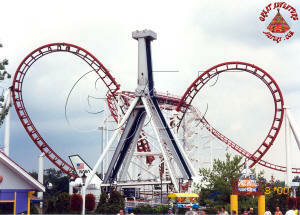 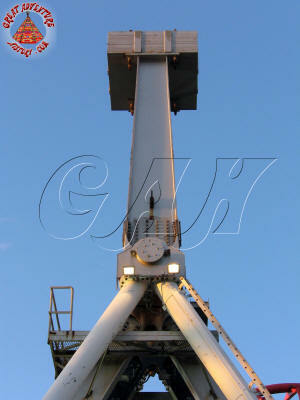 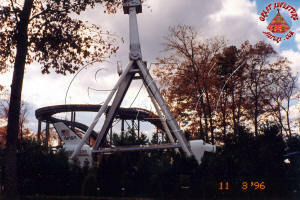 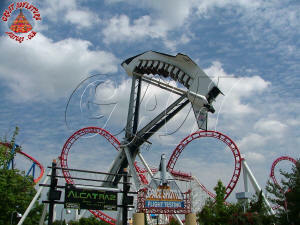 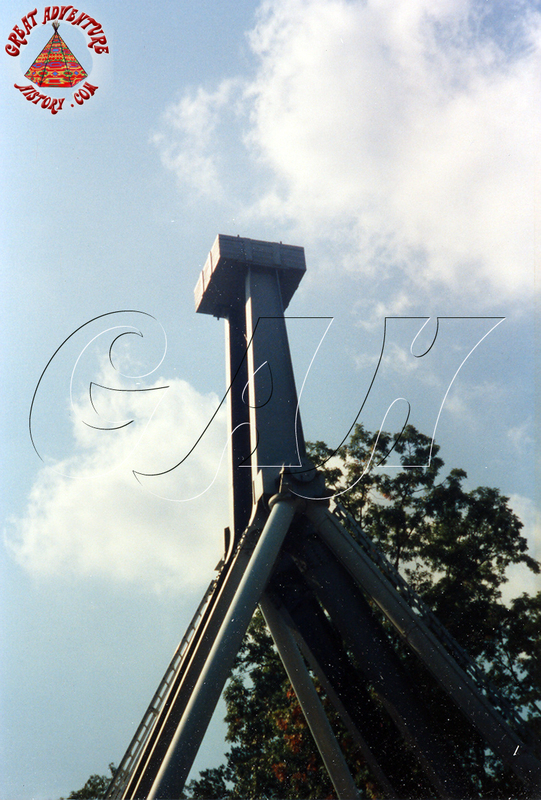 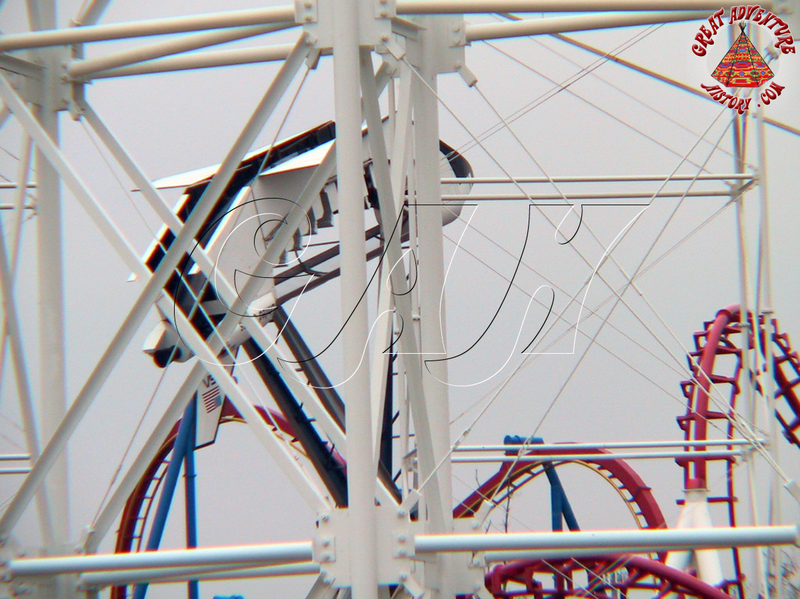 The ride's massive counterweight, support arms, and ship's frame were sold off for scrap metal. 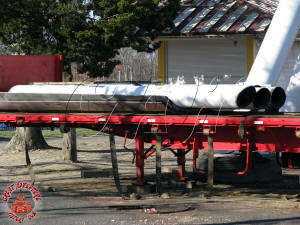 The bulky fiberglass body of the shuttle including its expansive wings were cut into pieces and discarded into dumpsters for removal. 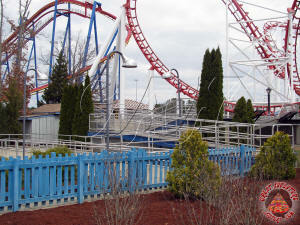 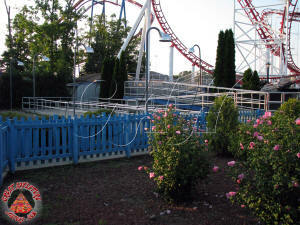 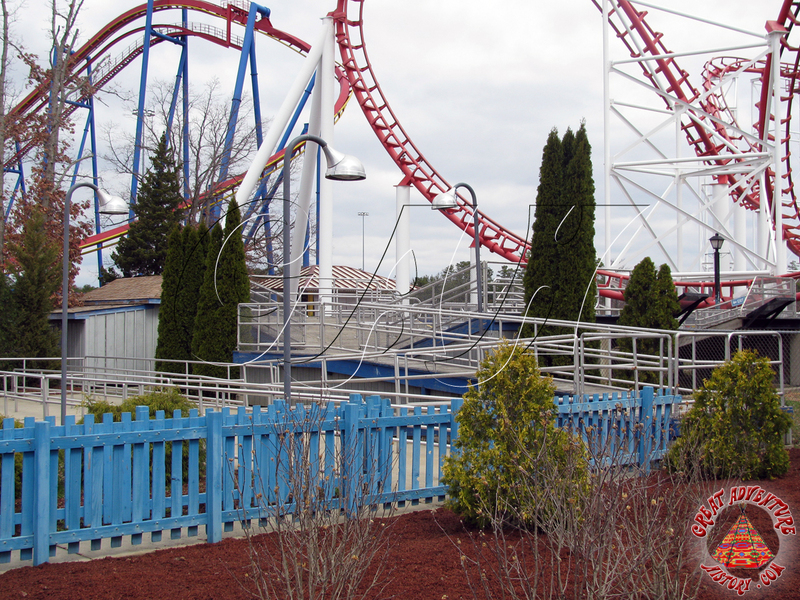 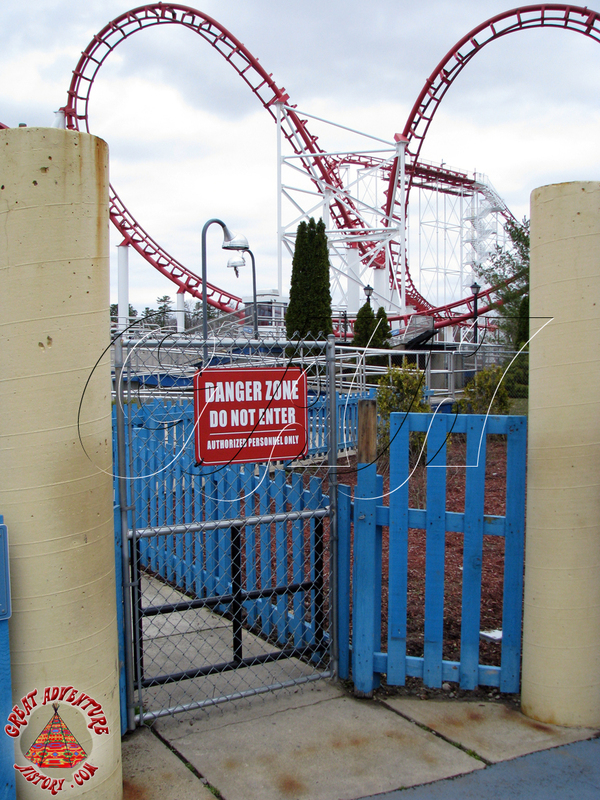 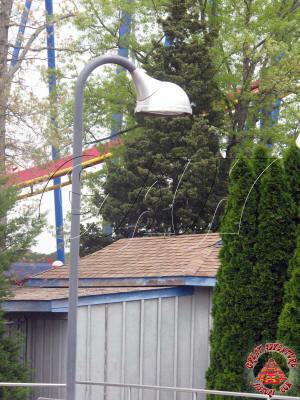 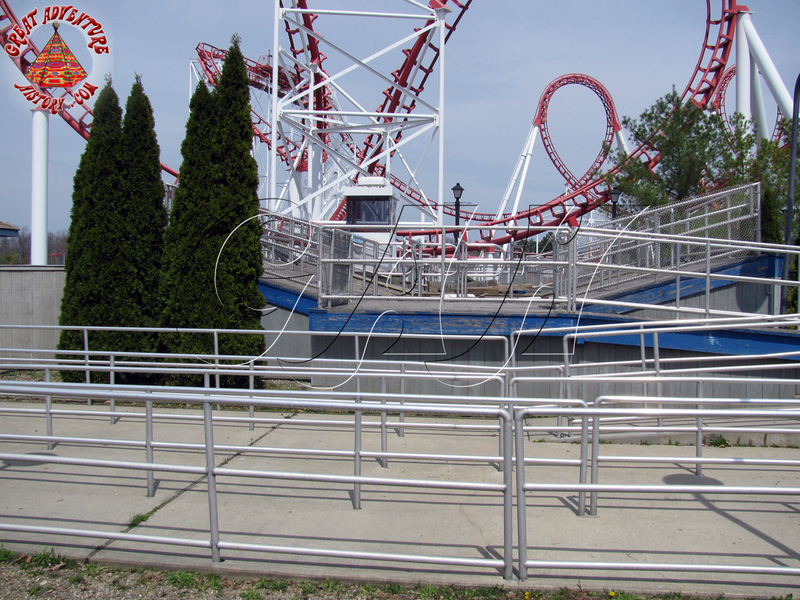 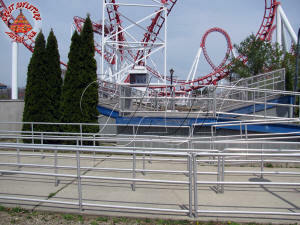 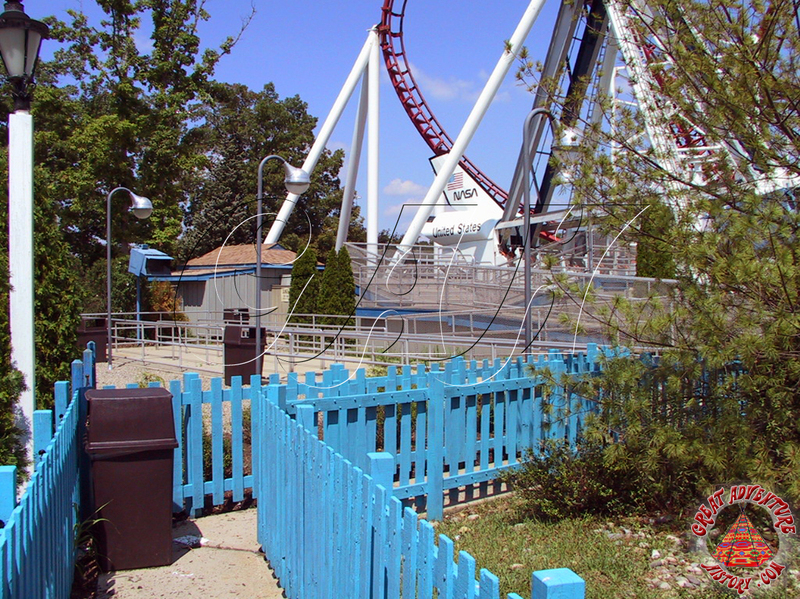 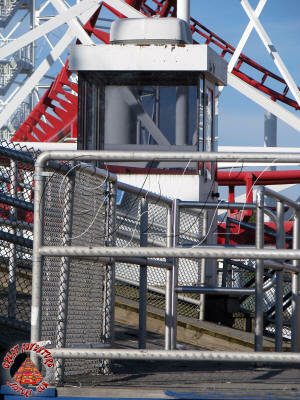 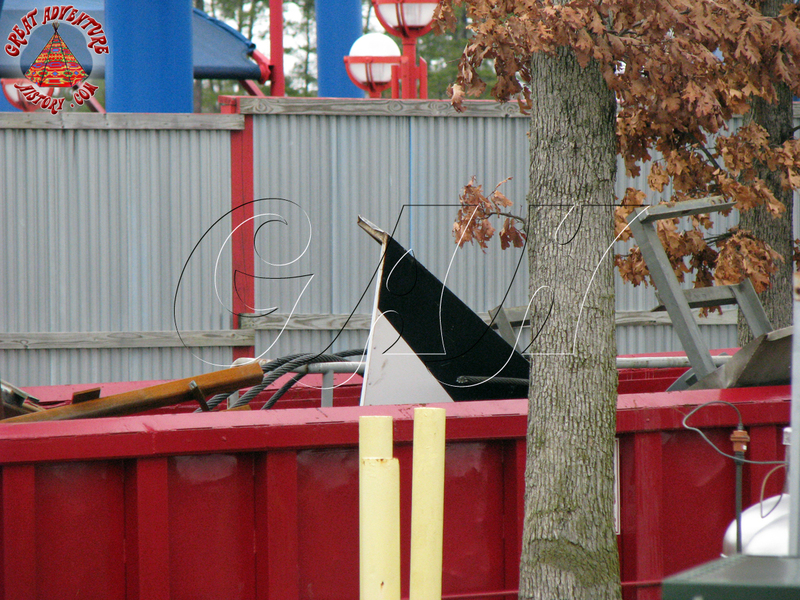 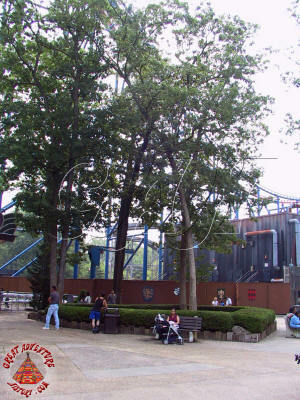 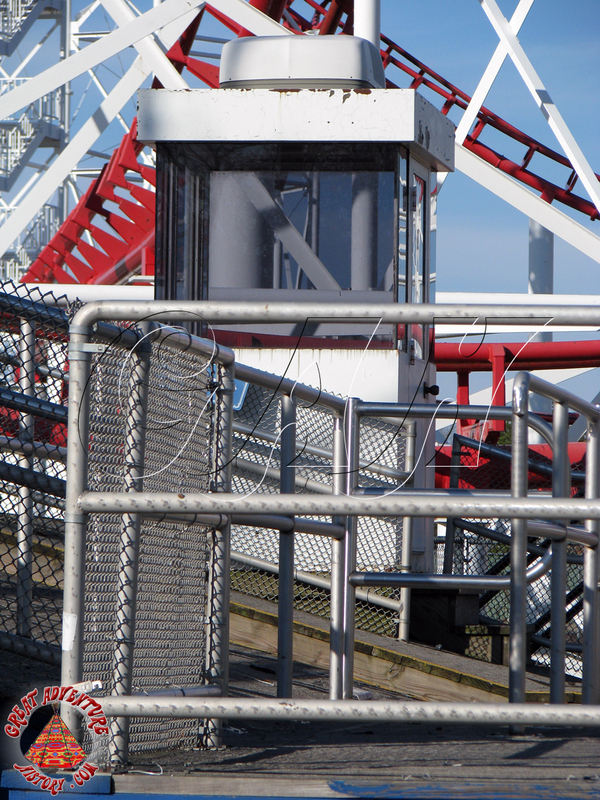 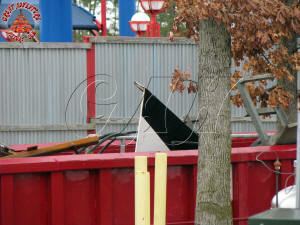 Evidence of the ride's existence remained in the park during the 2009 and 2010 seasons. 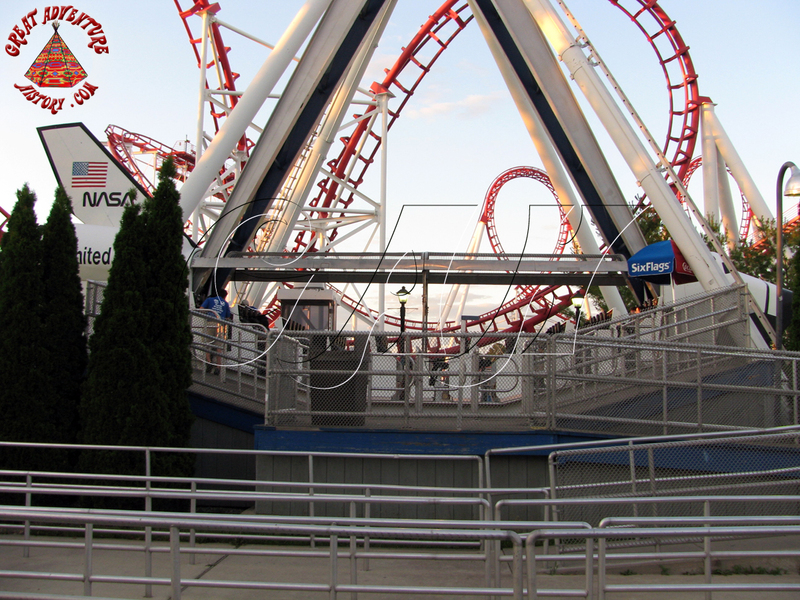 The Space Shuttle's entrance and exit paths as well as the queue area and loading docks stood vacant until the area was earmarked for development as part of the new for 2011 Green Lantern. 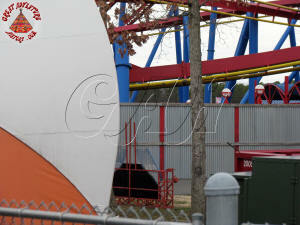 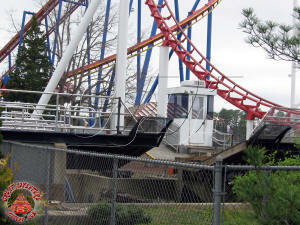 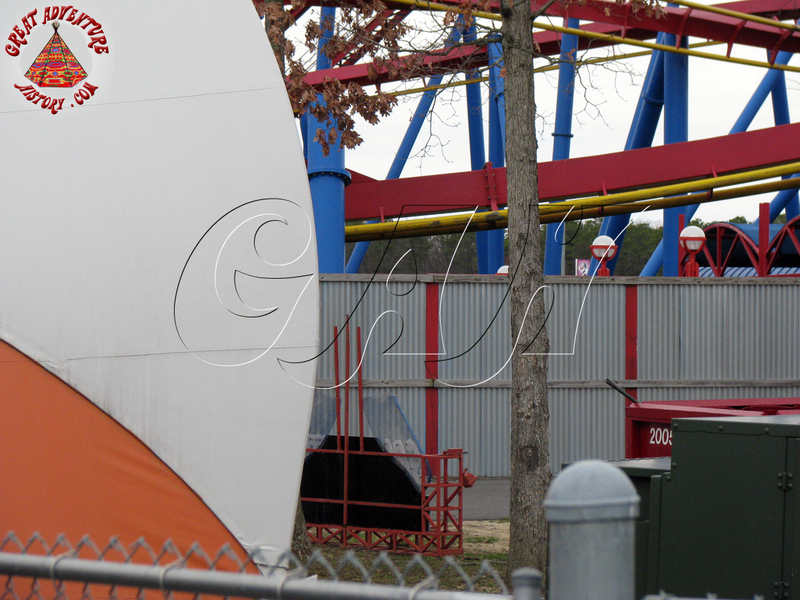 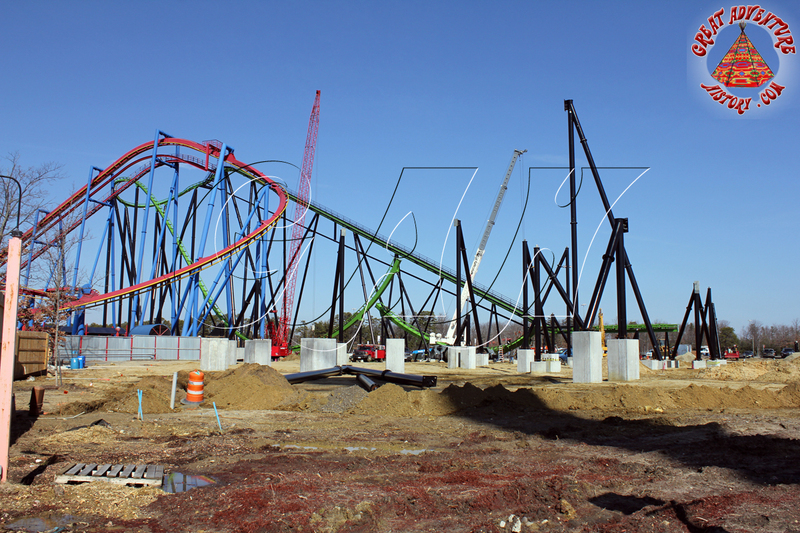 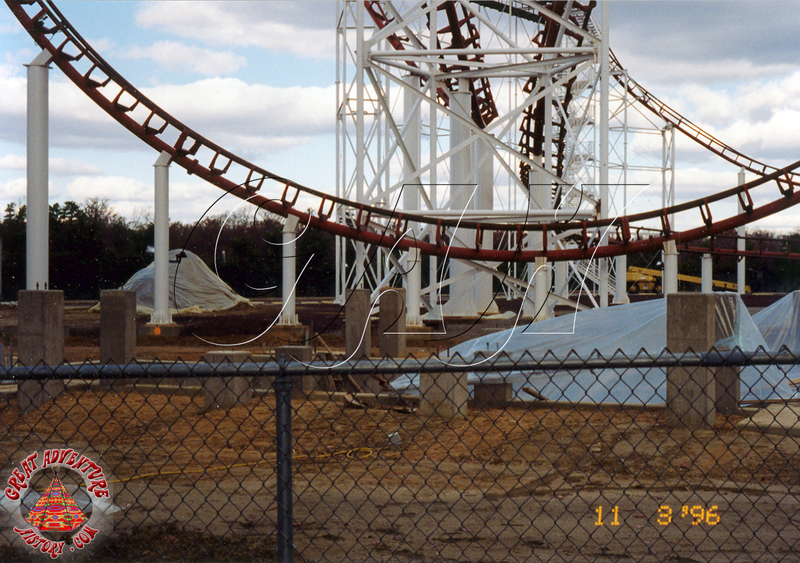 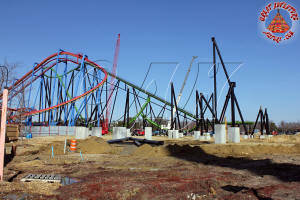 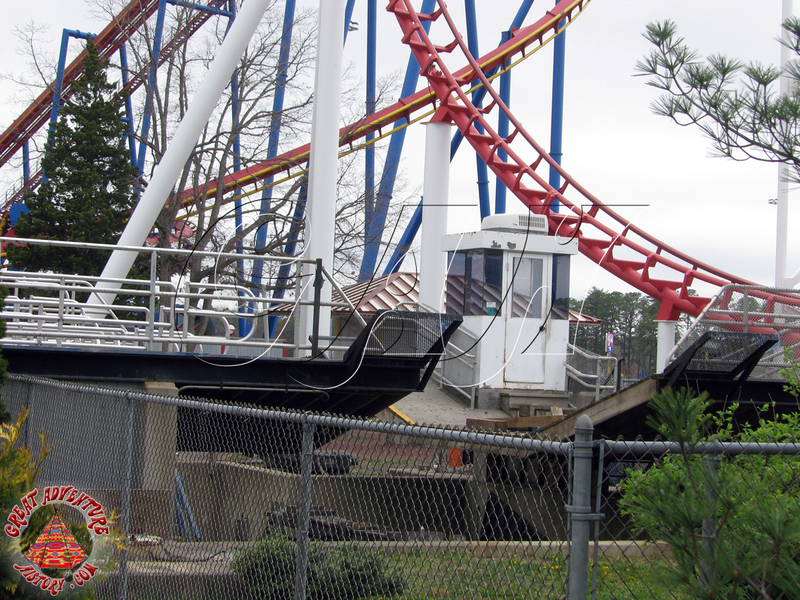 The Space Shuttle's site was completely leveled at the same time the Great American Scream Machine was removed for the park's new stand-up coaster addition.